The U.S. Government does not endorse products or manufacturers. Trademarks or manufacturers’ names appear in this report only because they are considered essential to the objective of this document. The Task Manager for this report was Richard Schaffer (FHWA Office of Safety). The University of North Carolina Highway Safety Research Center was a subcontractor for this report. The project team gratefully acknowledges the input provided by the technical working group over the course of this project. These individuals include: Craig Allred, Rebecca Crowe, Yon Lambert, Lauren Marchetti, Richard Moeur, Gabe Rousseau, Michael Sanders, Cara Seiderman, Tom Trowbridge, and Mighk Wilson. Contributions were also made by the following: Daniel Lovas, Kevin Moriarty, Jakob Helmboldt, Billy Hattaway, Matthew Carmody, Janet Jenkins, and Noah Bernstein. Images were provided by Dan Nabors, William DeSantis, Libby Thomas, Michael Sawyer, Matthew Carmody, and Jonathan Maus. Graphic design was provided by Jorge Quinones. Road Safety Audits (RSAs) are a formal safety examination of an existing or future roadway or off-road facility and are conducted by an independent, experienced, multidisciplinary team. 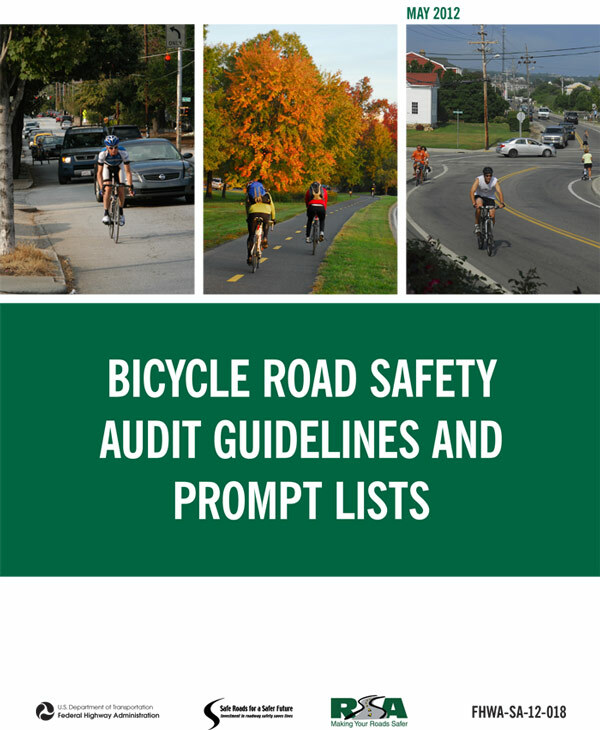 The purpose of the Bicycle Road Safety Audit Guidelines and Prompt Lists is to provide transportation agencies and RSA teams with a better understanding of the safety of cyclists in the transportation system when conducting an RSA. These Guidelines present the RSA team with an overview of basic principles of the safety of cyclists and potential issues affecting cyclists. They also provide information on how to conduct an RSA and effectively assess the safety of cyclists. Prompt lists describe safety considerations when conducting a cyclist-specific RSA. These Guidelines will help RSA teams evaluate and suggest a multimodal approach to safety by improving the safety of cyclists and all roadway users. Cycling has long been an effective method for travel and the primary means of transportation for many. Over the past several decades, the U.S. has experienced somewhat of a renaissance in cycling for recreation, health, and transportation. Adults as well as children are reconnecting with the enjoyment and mobility offered through cycling. Cycling provides an opportunity for regular aerobic exercise, which public health officials stress is necessary for good health. Many commuters have also found cycling to be a permanent and economical option to avoid traffic congestion and parking difficulties. Cycling is a popular mode of transportation that serves many needs — from commuting to recreation. Double the percentage of trips made by foot and bicycle. Subsequent legislation has supported cycling and the need to accommodate cyclists. The National Bicycling and Walking Study: 15–Year Status Report released in May 2010, provided an update of the status of biking and walking in the U.S.1 The report showed the percentage of bicycle trips to increase from 0.7 percent to one percent, whereas the percentage of walking trips increased from 7.2 percent to 10.9 percent. Collectively, cycling and walking accounted for 11.9 percent of all reported trips, falling short of the doubling goal (i.e., 7.9 percent to 15.8 percent). However, between 1990 and 2009, the number of reported bicycle trips more than doubled from 1.7 billion to 4 billion. This increase shows that, despite the slower than desired nationwide growth in the proportion of bicycle trips, some areas around the country have experienced a much larger increase in the percentage of people walking and bicycling. For example, between 2001 and 2007, Marin County, California experienced an average 66 percent increase in the weekday bicycling rate, a 33 percent increase on weekend days, and an average 8 percent increase in the weekday walking rate. (2) During this period Marin County implemented the Safe Routes to School Program and also participated in the Federal Non-Motorized Transportation Pilot Program. Other areas, such as Washington, D.C. (referred to subsequently as the District), have also seen a large increase in the number of people bicycling. In 2010, 2.2 percent of people biked to work, a rate that had almost doubled over the previous 10 years,(3) and from 2008 to 2011 the number of cyclists in the District increased by over two-thirds. (4) This increase can be attributed in part to an expansion of the facilities available to bicyclists, as well as greater access to bicycles. The District has installed bicycle lanes and bicycle storage facilities and in 2008 initiated the Capital Bikeshare Program, providing public access to rental bicycles throughout the city. In New York City, commuter cycling doubled between 2007 and 2011. 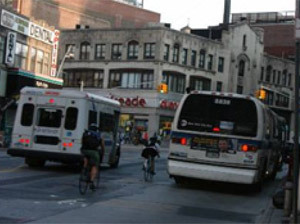 (5) During this period, the New York City Department of Transportation (NYCDOT) launched numerous programs and initiatives to make cycling and walking safer, such as implementing 90 miles of new bicycle lanes in 2008 that contributed to a record 35 percent single-year increase in commuter cycling. In 2012, the city’s first bike share program will begin implementing a plan to build 600 stations housing 10,000 bikes. This program should increase commuter cycling even further and increase utilization of the city’s nearly 400 bike-lane miles. 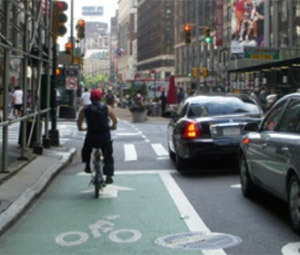 The addition of bicycle lanes, bike boxes, and other facilities in New York City has lead to a dramatic increase in cycling (Photographs from NYCDOT). In terms of safety, the National Bicycling and Walking Study report indicated that the original goal of reducing the number of crashes involving cyclists and pedestrians by 10 percent has been surpassed. (1) Since 1995, the number of cyclist and pedestrian fatalities has decreased by more than 20 percent (from 6,452 to 5,094 fatalities), while the number of cyclist and pedestrian injuries has decreased by over by 16 percent (from 145,000 to 121,000 injuries). Overall, injury trends from national estimates demonstrate a generally more consistent downward trend since 1995, although 2008 appears to be a significant exception, with an increase of more than 20 percent in injury crashes from the previous year. The increase in bicycle injuries in 2008 demonstrates the uncertainty and variability of these data, which is underscored by the fact that little is known about bicycle volumes and potential crash exposure. Typically, severe crashes causing a fatality are reported; however, less serious cyclist crashes are more frequent and underreported. Adding to the complexity, there are neither consistent roadway inventory nor inventory for off-road areas (e.g. sidewalks, parking lots, paths, parks, and playgrounds), where approximately one-third of bicycle injuries may occur. (7) Nearly three-fourths of the cyclists treated and released by hospital emergency departments were injured in non-roadway or non-motor vehicle incidents and were unlikely to be reported in State traffic records. (8) It is evident that trends—and the current safety status of cyclists—are largely unknown. What is known is that, over the past decade, between 629 and 786 cyclists were killed annually and an estimated 52,000 have been reported injured annually in the U.S.(9) Bicycle trips are more likely to result in a fatality or injury than motor vehicle trips. The estimated one percent of trips by bicycle accounted for two percent of all fatalities and injuries in 2009. Based on these data, expanded review of safety issues and implementation of countermeasures are necessary to effectively address the safety of cyclists. Increases in bicycle accommodations by State and local transportation agencies are certainly helping to address safety concerns and reduce cyclists’ risks. However, even these agencies are experiencing new and unique challenges never faced before. Road safety audits (RSAs) can be used to help address the safety of cyclists by improving the understanding of both the characteristics of cyclists and the factors that affect cyclist safety. An RSA is a formal safety examination of an existing facility or future roadway plan or project, that is conducted by an independent, experienced, multidisciplinary team. RSAs are a cost-effective method to proactively identify factors affecting safety and make suggestions on strategies and facilities to improve cyclist safety and support a truly multimodal street network for all types of facilities. The purpose of the Bicycle Road Safety Audit Guidelines and Prompt Lists is to provide transportation agencies and RSA teams with a better understanding of the safety of cyclists in the transportation system when conducting an RSA. These Guidelines emphasize considering the context of the cycling environment from a “behind the handlebars” perspective. This document is an expansion of the cyclist-related material in the FHWA Road Safety Audit Guidelines (10) previously published by the Federal Highway Administration (FHWA). The Bicycle Road Safety Audit Guidelines and Prompt Lists, a cyclist-specific RSA guide, presents RSA team members with safety elements they should consider when conducting a cyclist-specific RSA. While the authors have made every attempt to be as thorough as possible, persons performing RSAs are reminded that conditions vary from site to site and additional concerns not documented herein may arise. That said, agencies should tailor prompt lists to their individual needs. Not all prompts included in these Guidelines will be applicable for all areas. All elements of the roadway and pathway network where cyclists are permitted are covered in these Guidelines. RSA team members with an understanding of the RSA principles and process can use this publication to conduct an effective cyclist-oriented review of a facility or help ensure that the cycling component of the RSA is adequately considered. It is important to note, however, that an RSA involves a review of all modal behaviors, needs, and facilities. Other RSA resources, such as the FHWA Road Safety Audit Guidelines (10) and the FHWA Pedestrian Road Safety Audits Guidelines and Prompt Lists (11), may be helpful in conducting a thorough RSA. All elements of the roadway and pathway network where cyclists are permitted are covered in these Guidelines. This includes on-road accommodations (e.g., shared roadways and roads with designated bicycle facilities, like marked bicycle lanes) and off-road cycling facilities (e.g., shared used paths and separated bike facilities). Chapter 2: Basic Principles of Bicycle Safety—provides an overview of the basic principles of cyclist safety considerations and where potential cycling issues are likely to occur. Chapter 3: Cyclists in the Road Safety Audit Process—answers basic questions about conducting RSAs and how that process is applied to effectively assess and enhance cyclist safety. Chapter 4: Using the Bicycle RSA Prompt Lists—explains the structure of the prompt lists and describes how to effectively use them when conducting a cyclist-specific safety audit. Also presents the prompt lists and descriptions of the prompts, including examples of safety concerns that may be encountered. Prompt Lists—identifies potential safety issues affecting cyclists and the conditions contributing to those issues. Before conducting an RSA, it is critical that some RSA team members have an understanding of the design requirements for a cycling facility as well as the relative safety provided by various design features. Some RSA team members should also have an understanding of the necessary skills to bike, particularly in traffic. The following are resources that are important for the RSA team to understand. This list is not comprehensive, but having an understanding of these will help the RSA team members check for conditions that may create safety issues for cyclists. The glossary is intended to identify terms used in these Guidelines referring to bicycle facility planning, design, and engineering. This glossary will help to establish the appropriate and consistent terminology for everyone involved in the RSA process. Bicycle Boulevard—A street segment (or series of contiguous street segments) that has been modified to accommodate through bicycle traffic but discourage through motor traffic. Bicycle (Bike) Box—A defined and/or colored area at a signalized intersection provided for bicyclists to pull in front of waiting traffic. The box is intended to reduce car-bike conflicts, particularly involving right-turning movements across the path of a bicyclist, and to increase bicyclist visibility. Figure 1. A Depiction of Key Terms Used to Describe Roadway Elements that Relate to Cyclists. Bus/Bikeway—A marked lane for exclusive use by buses and cyclists. May also be referred to as a bus/bicycle lane. Complete Streets—Roadways that are designed with the safety of all users in mind, including but not limited to motorists, pedestrians, bicyclists, and transit users. Contraflow Bicycle Lane—A bicycle lane that allows bicyclists to travel the opposite direction of motor vehicle traffic on a one-way street. 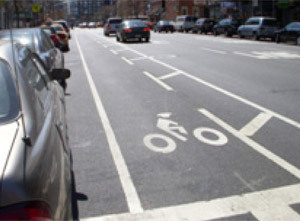 Cycle Track—A bicycle facility, typically unidirectional, that is separated from motor vehicle travel lanes, as well as sidewalks and pedestrians, by a physical barrier such as on-street parking or a curb, or is grade-separated (see Figure 2). Figure 2. An Example of a Cycle Track on a City Street. Cyclist (Bicyclist, Rider or Bike Rider)—A person who is riding a bicycle as defined above. Loop Detector—An inductive (wire) loop embedded in the pavement that detects the presence of a vehicle at a signalized intersection to activate a signal change. 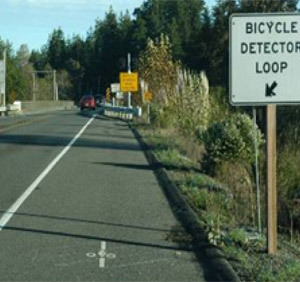 Diagonal quadruple loops typically provide the best bicycle detection. Multi Use Path—See Shared Use Path. 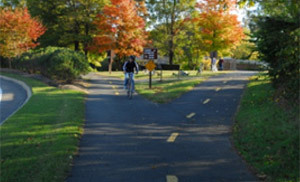 National Bike Routes—A national network of bike routes that may span multiple States or have national or regional significance. On-road Accommodation—A facility that is part of the roadway or traveled way that is typically used by bicyclists and/or motor vehicles such as a shared lane, wide curb lane, bicycle lane, or bikeable shoulder. Off-road Accommodation—A path that is separate from the roadway used by motor vehicles. 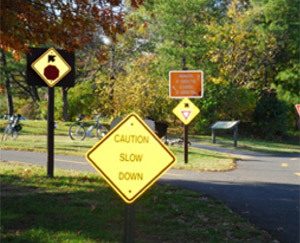 This may parallel a roadway or may be separate from a road, as it may pass through parks within the public right-of-way or on private right-of-way. This can be separated from pedestrian traffic (bicycle path) or shared with pedestrian traffic (shared use path). Path—See Shared Use Path. Non-descriptive, general term. Paved Shoulder—The portion of the roadway contiguous with the traveled way for accommodation of stopped vehicles, for emergency use, and for lateral support of sub-base, base, and surface courses (see Figure 1). (12) Use by cyclists may be allowed or prohibited based upon specific State laws. 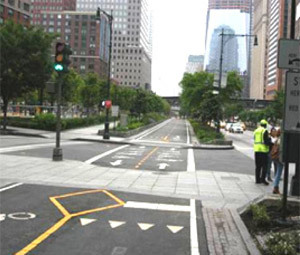 Separated Bicycle Facility—A bikeway within or adjacent to the roadway and separated from moving traffic by barriers or curbs, parking lanes, striped buffers, and other means. (13) Separated bicycle facilities may be unidirectional or bidirectional. Shared Lane—A lane of a traveled way that is open to bicycle travel and motor vehicle use. Narrow Lane—A travel lane less than 14 feet in width, which therefore does not allow bicyclists and motorists to travel side-by-side within the same traffic lane and maintain a safe separation distance. 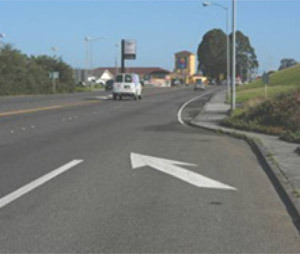 Wide Curb Lane—A travel lane at least 14 feet wide, adjacent to a curb, which allows bicyclists and motorists to travel side-by-side within the same traffic lane. Shared Roadway—A roadway that is open to and legally permits both bicycle and motor vehicle travel (12); any existing street where bicycles are not prohibited. 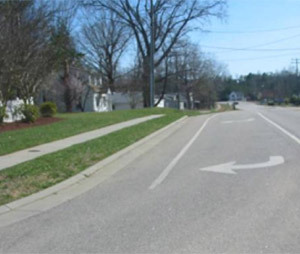 Traffic Calming—A way to design or retrofit streets to encourage slower and more uniform vehicle speeds. 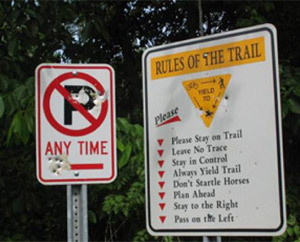 Trail—Non-descriptive general term typically referring to off-roadway facilities but with no standardized definition. Use should generally be avoided as it may refer to a range of facilities, including a coarse, unpaved hiking/biking route or a paved urbanized facility. This chapter provides a brief overview of elements that affect cyclists’ safety. RSA teams should have an understanding of these elements to better evaluate the cycling environment and improve the quality and safety of facilities that support cycling as a mode of travel. Cycling refers to a range of uses for bicycles, including commuter bicycling, as well as recreational uses, exercise, and children riding bikes to and from school. Cycling has experienced a resurgence by commuters looking for an alternative means to access the workplace, a healthier mode of transportation, and a new way to utilize connections to transit, particularly in cities and suburbs where traffic congestion and rising fuel prices are influencing commuters to consider alternative modes. In some areas, cycling as a commuter choice has doubled in recent years, and investment in infrastructure improvements to accommodate cyclists has increased. (16) Initiatives, such as Complete Streets policies, recognize the importance of cycling in the proper context, and bike share programs have made bicycles more accessible to people, particularly in urban areas, college campuses, and communities pursuing sustainable transportation systems. However, bicycling safety issues persist and will become increasingly relevant as bicycling activity continues to expand, highlighting the importance of providing appropriate levels of bicycle accommodation on a range of transportation facilities. There are many factors that affect the safety of bicycling. It is crucial for the RSA team to understand the range of characteristics exhibited by cyclists using various facility types and how designs may or may not accommodate the range of bicycle types and cyclist abilities. A wide range of bicycle, cyclist, and facility characteristics should be considered as part of an RSA. In the past, cyclists were categorized corresponding to riding ability and comfort with speed and proximity to other vehicles to simplify considerations in the planning and design process. Now it is better understood that different abilities of cyclists should be considered on all types of facilities. To accommodate a range of cycling characteristics on any bicycle facility, it is important to understand the physical and operational attributes of bicycles and cyclists. 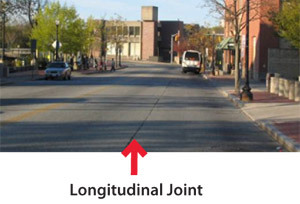 Length—Relates to space needed for longitudinal clearance, which may be especially critical at intersections where motor vehicles, bicycles, and pedestrians share space. Longitudinal space should consider the varying lengths of bicycles that are expected to use a facility and the impact on safety (see Figure 4). For example, at a midblock crossing of a shared use path, the space dedicated to a cyclist in the refuge area may need to adequately accommodate a bicycle and trailer without encroaching on the roadway. Cyclists typically need to maintain a reasonable level of speed to remain stable. At slower speeds, cyclists begin to lose stability and will often “zigzag” to maintain stability. In the context of bicycle control, ”zigzagging” is moving from side-to-side (i.e., laterally) in an effort to maintain balance. (17) This behavior is also performed at higher speeds with less lateral deflection. The speed and stability of a bicycle are related to its space requirements (i.e., the wider the zigzag movement, the more unobstructed lateral space required). Facilities used by cyclists should be smoother than those deemed acceptable for motorized traffic. It is also important that debris be cleared from facilities used by cyclists. Surface conditions can also affect the stability of a cyclist. Rough and slippery surfaces can contribute to a cyclist losing control. The environment can also play a role, with wet and windy conditions affecting traction and stability. Destabilizing wind conditions can be due to environmental conditions or air flow caused by large vehicles passing. Speed, Deceleration, and Stopping—Travel speed may vary greatly depending on the terrain, type and quality of the bicycle equipment, and the skill and competency level of the cyclist. Often, differences in speed are most pronounced on long uphill gradients, where the relative physical abilities of cyclists are a significant factor. Conversely, on downhill gradients, even novice cyclists can achieve similar speeds to the more experienced cyclists and adjacent motor vehicles. Cyclist speed has a particularly important bearing on line-of-sight considerations at intersections and the ability for cyclists to safely navigate the intersection (including elements such as the distance required to stop, the time needed to decelerate, and surface conditions affecting friction). Vulnerability—Cyclists are vulnerable road users. Unlike motorists, who are afforded protection within the structure of a vehicle, bicycles offer little or no protection to a cyclist. Cyclists may or may not understand their vulnerability and, as a result, may allow real or perceived environmental factors, such as availability of dedicated bicycle facilities, frequency of conflict points with other users, time of day, surface quality, types of vehicles, and terrain to influence route selection and other riding behaviors. For example, cyclists may choose routes with more conflict points, such as at driveways or intersections, to reduce perceived conflicts with same-direction traffic. Facilities for cyclists, whether on-road or off-road, should be part of a network that connects cyclists to urban, suburban, and rural land uses. The context of the road for a bicycle facility is a key element that should be considered in the design. The type and level of accommodation must be appropriate for the characteristics of the surrounding conditions. A “one-size-fits-all” approach may result in an underutilized facility or a facility that does not improve cycling safety, and, in some instances, may degrade cyclist safety. There are several factors that should be considered in all contexts to provide safe accommodations for cyclists. Directness—The cycling network should be direct between key destinations, considering both distance and time. (17) On a corridor level, it is important to understand the “desire lines” of cyclists accessing key destinations. While directness typically refers to the shortest path to access destinations, it is influenced by travel time factors (e.g., the speed of a route) that may be influenced by the number of stops, grade, and other factors. Frequent stops and steep, uphill sections along a corridor can be a significant burden to cyclists operating under their own power. Continuity and Connectivity—The cycling network should be continuous (i.e., without gaps or abrupt changes) and provide convenient linkages to destinations. Often, it is the transition between different land uses and environments where the nature of cycling accommodations changes. For example, a separated facility along public property may become a bicycle lane or an undesignated area where cyclists ride with traffic. Continuity may also relate to any aspect of a facility, such as available riding space or quality. Comfort—Cyclist comfort level and perceived risk should be considered, as they may influence route choice and riding behaviors. When presented with facilities on high-speed, high-volume roadways, some cyclists may be more comfortable when dedicated space is provided to create separation from motorized traffic. 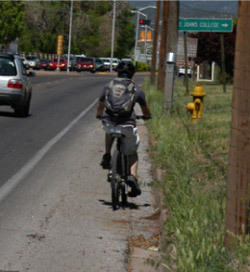 A lack of adequate riding space or a concern for personal safety will often influence route selection and other riding behaviors, including cyclist use of sidewalks. Within an area studied as part of an RSA, it is critical to understand that cyclist behavior is greatly influenced by route preference and the cyclist’s perceived risk of the route or path intended for their use. Crash data analysis is one method to identify factors contributing to collisions and to identify area-wide or location-specific crash trends that warrant further safety audit. However, an RSA team should consider that reported crashes may not capture the entire crash and injury picture. Typically, reported crashes only represent a fraction of the total number of cycling crashes occurring on public roadways. For many jurisdictions, official crash reporting does not include bicycle-only crashes that occur on the roadway, bicycles striking fixed objects, or crashes between cyclists and pedestrians. A multi-State study for FHWA based on hospital emergency department8 data suggests that typical State crash databases, even with a high rate of reporting, may only capture about one-fourth of the crashes serious enough to require treatment at a hospital emergency department and less than half of the crashes on the roadway that resulted in serious cyclist injuries. The RSA team should consider that the reported crashes only represent a portion of the bicycle-related crashes that occur. Cycling crashes on sidewalks, parking areas, or off-roadway paths are also unlikely to be included in most State and local reported crash databases. At least one-fourth of the significant injuries in the hospital study resulted from crashes in non-roadway areas; about half of these were on sidewalks. Since the FHWA study was performed, there has been significant expansion in off-roadway infrastructure, including shared use paths. Data on crashes with motor vehicles on roadways or at roadway-path intersections should be available from State or local crash databases. However, data are typically lacking on how many cyclists are being injured in bicycle-only falls, crashes with other non-motorized users or objects, or in crashes in off-road areas, including shared used paths and path junctions. The RSA team should consider that the reported crashes only represent a portion of the crashes that have occurred. The RSA team should consider seeking other sources of data, such as hospital or emergency department records or indications of bicycle crashes from self-reports to area agencies. Local cyclists may be able to provide information on cycling conditions. The team should also focus on conflicts and conditions that are likely to have contributed to unreported crashes. National, State, and local studies have highlighted some of the factors frequently associated with reported bicycle crashes with motor vehicles, including pre-crash maneuvers and events leading up to crashes. These descriptive statistics may help to identify crash trends and identify areas where RSAs may be conducted; however, RSAs should include an analysis of site-specific crash data to similarly identify trends in crash locations (e.g., intersections or segments), types (e.g., a vehicle turning into the path of cyclist or wrong-way cycling), injury level, time of day, and roadway and environmental factors that indicate operational or design issues potentially contributing to crashes. Since bicycle crash data may be scarce, detailed crash reports should also be examined to determine specific circumstances that may have contributed to crashes at individual locations. Finally, observing conditions and behaviors in the field is critical to a comprehensive understanding of the conditions underlying bicycle safety issues, because even detailed crash descriptions may not capture the nature of existing safety issues. RSAs are a useful proactive tool to identify issues on a system-wide or corridor-wide basis, including at locations where crashes may not have yet occurred (or been reported). A majority of bicycle-motor vehicle collisions (approximately 70 percent) occurred in urban areas where more cycling occurs. Approximately one-half (51 percent) of the bicycle crashes occurred at intersections or were related to intersections, 22 percent occurred at junctions with commercial and private driveways or alleys, and the remaining 27 percent occurred on roadway segments. In compact urban areas with a dense street grid (and relatively short intersection spacing), an even higher proportion of collisions may occur at intersections. For example, an analysis of bicycle crashes in Cambridge, Massachusetts found that 68 percent occurred at intersection locations (39 percent unsignalized and 29 percent signalized). (19) Other studies have analyzed trends in location by comparing urban and rural environments. Figure 5 compares intersection-related versus non-intersection-related crashes in North Carolina. In urban areas intersection-related crashes involving a cyclist were more prevalent than non-intersection crashes while in rural areas non-intersection related crashes were higher. Geographic information systems (GIS) or other spatial analyses can help to identify area-wide crash concentrations, and corridors or intersections that may benefit from an RSA. For example, in the Orlando metropolitan area, one-fourth of bicycle crashes with motor vehicles were concentrated on 19 corridors that made up less than one percent of the street centerline miles. These corridors may represent high motor vehicle and high bicycle volume corridors and may present an opportunity to make corridor-wide safety improvements. Spatial analyses of specific crash locations may range from simple, such as creating a push-pin map, to more detailed analyses using GIS or other software. Examples of spatial crash analyses using GIS are shown in Figure 6. The occurrence of bicycle crashes varies substantially by season, as the prevailing weather has a significant impact on the number of bicycle trips, surface conditions, and visibility. The multi-State FHWA study noted a strong seasonal trend in crashes, with 69 percent of collisions occurring over the months of April to September (spring and summer). (7) These trends are likely associated with variation in level of riding activity across the seasons but could also incorporate other risk factors that vary by season. For example, some regions would likely see different trends depending on year-round temperatures, rainfall, snow and ice, and other seasonal factors, such as presence of college campuses and trends in tourism. In high-tourist areas, both drivers and cyclists may be unfamiliar with roadways, traffic patterns, or local traffic laws, and may need more wayfinding assistance, among other possible remedies. The most common types of crashes found in both rural and urban areas from the six States in the early 1990s study by FHWA (7) are shown in Table 1, with more recent data from North Carolina (22) and the Orlando metropolitan area included, as well. (24) The data from Orlando represent crash distributions in a large metropolitan area, while the data from North Carolina represent trends from all urban areas (municipalities) and from all rural areas of North Carolina. The crash types shown in Table 1 accounted for nearly 89 percent of all crashes in the six-State FHWA study, approximately 84 and 90 percent of crashes in urban and rural areas of North Carolina, and 76 percent of crashes in the Orlando metropolitan area. As the data in the table illustrate, the distribution of crash types may be different for each area and will depend on site-specific conditions. The RSA team should consider ways that the environment and roadway conditions may have contributed to such crashes as well as behaviors that should be addressed through enforcement and education. Table 1. Bicycle-Motor Vehicle Crash Types from FHWA’s Six-State Study (7), North Carolina, and Orlando, Florida Metropolitan Planning Organization (MPO). Despite the differences in the types of crashes, there are some general trends that merit consideration by the RSA team. One of the most frequent group of crashes in the national, North Carolina urban, and Orlando metropolitan area studies involved motorist failure to yield at intersections (signalized, sign-controlled, or uncontrolled). These crashes include motorists pulling out or driving into intersections and into the path of bicyclists on initial crossing paths. Motorists and bicyclists may fail to stop for a red signal indication or a stop sign, or pull into the path of each other at a stop-controlled location after initially stopping, including to make right turns on red or to make right or left turns at stop signs (see Figure 8). Cyclists may contribute to these types of crashes by riding the wrong way (against traffic), on the sidewalk, or both. Nearly one-third (32 percent) of all cyclist collisions in the FHWA study involved cyclists riding against traffic; for intersection collisions, the proportion was 42 percent. (7) The Orlando metropolitan area study found that 43 percent of cyclists were riding against traffic. Both wrong-way and sidewalk riding place cyclists in positions where they are not expected by motorists at intersections and at driveways. Crashes at driveways are categorized as motorist failure to yield – midblock. The RSA team should examine conditions that may contribute to wrong-way or sidewalk riding, as well as conditions at intersections that might contribute to these types of crashes. Cyclists may be using sidewalks because they are uncomfortable with traffic or roadway conditions. Sidewalk and wrong-way riding may also be prevalent if shared use paths do not have adequate connections in both directions of a multilane or divided roadway. The category of bicyclists failing to yield at intersections was also a frequent group of crashes in the national, North Carolina urban, and Orlando metropolitan area studies. Cyclist ride-throughs at stop signs or traffic signals are a frequent crash type in urban areas. Frequent stops along a corridor can be a significant burden to cyclists trying to conserve energy or avoid unclipping from foot pedals. A route that provides few stops for cyclists could improve safety and mobility for cyclists. These crashes also can occur when a cyclist is attempting to cross a multilane or high-volume roadway and has difficulty identifying a suitable gap in traffic. Side streets on high-volume, high-speed roads are often stop-controlled with no controls on the main road and may be a challenge for cyclists. Factors or conditions similar to those described at junctions may also affect access from commercial or private driveways (categorized as bicyclist failure to yield – midblock). Parking or other sight distance issues are among other factors that could also contribute to such crashes. Traffic signals without automated detection for bicycles may contribute to cyclists riding through after slowing or stopping. Cyclists may also fail to clear an intersection before being struck by motorists who may or may not have stop-control in their direction of travel (bicyclist failure to clear intersection). This crash type may also be difficult to identify from crash data, but signal timing can be used to verify adequate clearance intervals for both cold starts after a recent signal change and for riders proceeding at the end of the green indication. Among parallel path crashes, the most frequent group of crashes in the national, North Carolina urban, and Orlando metropolitan area studies was motorist turned or merged into the path of a bicyclist. This crash type includes motorists turning left into the path of a through bicyclist, most often from the opposite direction but sometimes from the same initial direction as the bicyclist. Such crashes may occur when a motorist is looking for a gap to turn left and oncoming bicyclists are obscured from view by approaching motorists in front of the cyclist or in another lane. Figure 9 illustrates how such crashes may occur with cyclists. This group also includes motor vehicles striking bicyclists when making right turns. The motorist may make a “right hook” maneuver because they misjudge the speed of the bicyclist traveling along the right side of the roadway or they mistakenly believe that the bicyclist should yield right-of-way (see Figure 10). Crashes involving right-turning vehicles can also occur just after a signal change when drivers planning to turn right do not see bicyclists approaching in their blind spot. Another cause includes drivers turning after waiting for pedestrians to clear from a crosswalk without observing a bicycle approaching from the rear. The group of crashes involving motorists overtaking bicyclists may include situations where the motorist may fail to detect the bicyclist in time due to a curve or other sight distance issue (see Figure 11), the bicyclist may suddenly swerve left to avoid a pothole or other obstacle, or the overtaking motorist may detect the cyclist but fail to allow adequate time or space for safe passing. This type of crash represented between eight and nine percent of motor vehicle-bicycle crashes in the six State FHWA study, the North Carolina urban areas, and the Orlando metropolitan area. In rural North Carolina, this type of crash represented nearly 30 percent of motor vehicle-bicycle crashes, indicating that this may be a more significant issue in rural areas. Measures to improve sight distance, reduce vehicle speeds, enhance lighting, or provide delineated space for cyclists may be appropriate, depending on conditions present. Riding at night is also a frequent crash occurrence among cyclists as reported in the FHWA study7 and in the Orlando metropolitan area study,(23) with crashes involving cyclists during low-light conditions accounting for 21.3 percent and 22.1 percent of bicycle crashes, respectively. However, it is not clear how many of these crashes involved cyclists using active lighting—that is white headlamps or headlights facing the front and red taillights facing the back. Active lighting is important for motorists to be able to detect cyclists at night. Most States have active bicycle lighting laws that should be supported and enforced. Although not a large percentage of crashes, turning errors involve either the motorist or bicyclist turning into the wrong lane at the end of their turn. Driveway and intersection design may facilitate slower turning speeds to help reduce the chances of this type of collision. The RSA team should consider these trends when conducting an RSA. However, a site-specific analysis of data and detailed field observations are essential when conducting an RSA. Chapter 3 provides details to consider beyond analyzing crash data. This section provides detailed information pertaining to cyclists in the RSA process. General information about RSAs, such as RSA policies and procedures and generalized prompt lists, are included in the FHWA Road Safety Audit Guidelines. (10) The Pedestrian Road Safety Audit Guidelines and Prompt Lists (11) can also be used as a reference when conducting RSAs, particularly when considering how different modes of travel interact. 3.1 What is an RSA? As noted in Chapter 1, an RSA is a formal safety examination of a future roadway plan or project or an in-service facility and is conducted by an independent, experienced, and multidisciplinary RSA team. The primary focus of an RSA is safety while working within the context of mobility, access, surrounding land use, and/or aesthetics. RSAs enhance safety by identifying potential safety issues affecting all road users under all conditions and suggesting measures for consideration by the design team or responsible agency. An RSA is not simply a standards check. Standards checks are part of the design process to ensure adherence to design standards and guidelines. Although the RSA team may identify safety issues by comparing items of concern to standards, the general intention of the RSA is to identify areas where applied standards may interact with road user behaviors to generate a potential safety issue. Formal—an eight-step procedure is followed. Safety Examination—the focus is to identify potential safety issues. Independent—RSA team members should be independent of facility ownership, design, and operation to ensure an unbiased review. Multidisciplinary—various backgrounds help ensure all aspects of safety performance can be adequately addressed. 3.2 What Should be Considered for an RSA? 3.3 Who Should Conduct RSAs? 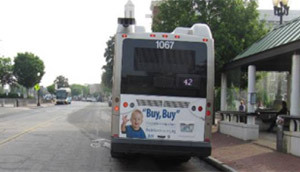 An increasing number of State and local transportation agencies are using RSAs as a proactive tool for improving safety. Moreover, cyclist safety is a major concern for many local agencies and, as such, they may find a greater need for conducting a bicycle-oriented RSA. Since the independence of the audit team is a requirement of an RSA, local agencies are encouraged to contact the State Department of Transportation (DOT), the Local/Tribal Technical Assistance Program (LTAP/TTAP) center, the FHWA division office, or the FHWA resource center for assistance in finding team members. The local agency may also find it helpful to contact neighboring local agencies directly to assemble an independent team. Considerations for the RSA team responsibilities, skills, and size are discussed in Section 3.5. 3.4 When Should RSAs be Conducted? A pre-construction RSA (planning and design stages) examines a road before it is built, at the planning/feasibility stage or the design (preliminary or detailed design) stage. An RSA at this stage identifies potential safety issues before crashes occur. For example, an existing bicycle route may approach an intersection widening project. Cyclists must be safely accommodated through the new geometric layout. The earlier a pre-construction RSA is conducted, the greater is the potential for designers to efficiently and effectively remedy possible safety concerns. Construction RSAs (work zone, changes in design during construction, and pre-opening) examine temporary traffic management plans associated with construction, or other roadwork and changes in design during construction. For example, roadside construction barriers may eliminate a bicycle lane or available shoulder where cyclists ride, causing them to enter the mainline traffic stream. The RSA should assess the safety of cyclists under these conditions and examine measures to mitigate potential issues. RSAs can also be conducted when construction is completed but before the roadway is opened to traffic. A post-construction or operational RSA (i.e., of an existing road) examines a road that is operating and is usually conducted to address a demonstrated crash risk. Many older roadways, in particular, were not designed with adequate consideration of the needs of bicyclists. Conducting an RSA on existing facilities presents opportunities to retroactively improve bicyclist safety and to consider the needs of bicyclists where cycling activity has increased since construction. 3.5 How is an RSA Conducted? The eight steps recommended by FHWA to conduct an RSA, along with suggestions for adequately considering cyclists in the process, are described in this section. Figure 12 illustrates the progression of these steps. The responsibilities of the project owner/design team and the RSA team may vary during the course of an RSA. Figure 12. Eight-Step RSA Process. The facility or project owner identifies the location(s) to be reviewed during the RSA. The owner should develop clear parameters for the RSA (the term “owner” in this document to refers to the person or agency that owns or is responsible for the project or facility). Evaluating the safety of cyclists may require the RSA team to investigate a parallel bicycle path or route, transition points for bicycle facilities both inside and outside of the RSA study area, or other conditions that may affect the safety of cyclists in the study area selected. Ultimately, parameters should be set that define the RSA scope, schedule, team requirements, tasks to be completed, report format and content, and response procedures. The facility or project owner is responsible for selecting the RSA team or the RSA team leader. To ensure there is no conflict of interest and a fair and unbiased evaluation will be conducted, the RSA team must be independent of the operation and design of the location(s) being assessed and cannot include members of the party charged with the development of the original plans or the facility owner. The facility or project owner may select a set of qualified individuals from within its own organization, another transportation agency, or contract with an outside group. If a non-independent assessor wishes to evaluate the cyclist safety elements of a project, the process may still be valuable but should not be considered a formal RSA. Bicycles are almost always permitted to travel along the same roadways as motor vehicles. UVC§11-1202 is a statute that has been adopted in all 50 States and grants cyclists the same rights and duties as motorists. A member of the RSA team should be familiar with the laws applicable to cyclists and the interaction with other modes. The facility or project owner should select an RSA team that possesses a combined set of skills that address the most critical aspects of the project. For RSAs with a significant cycling component (i.e. bicycle RSAs), the team members should be aware of constraints and issues that affect cyclists and have a background in (1) road safety, (2) traffic operations, (3) road design, (4) cycling safety, operations, or planning (or someone who understands the skills necessary for cycling on the road with traffic), (5) transit operations, (6) enforcement (e.g., bike patrol officer), and/or (7) emergency medical services. The owner should consider including individuals from local cycling organizations or bicycle action committees, as they may provide valuable insights and detailed knowledge of the local area. The size of the RSA team may vary. 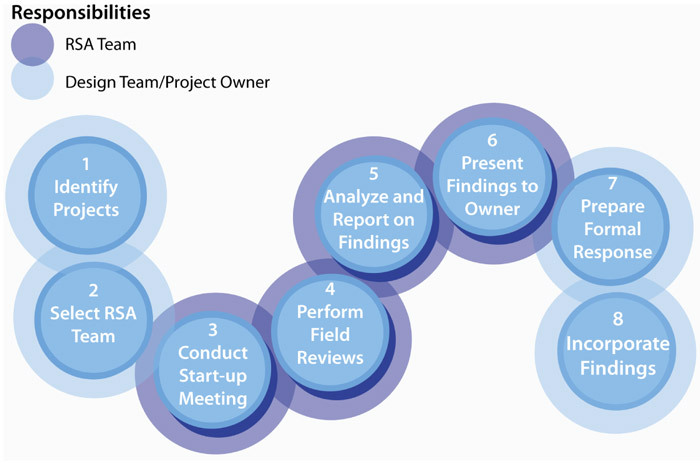 Small teams typically provide the greatest ability for team members to significantly contribute insights during the audit but may be limited in experience with the various areas of expertise. While three members may be adequate for some projects, that size may be insufficient for larger, more complex projects. The best practice is to have the smallest team that brings all the necessary knowledge and experience to the process. Relevant data, information, drawings, aerials, photographs, etc. Design constraints, standards used, related bicycle plans, and findings of previous studies. Local laws/statutes describing rights and duties of all road users, some of which are described in Figure 13. Figure 13. Legal Movements for Cyclists. If possible, the owner and/or design team should provide data describing the overall cycling characteristics of the location(s) being assessed. This could include cyclist crash data, vehicular and cyclist traffic volumes, locations of key cyclist generators, and local stakeholder requests and complaints. A listing of the potential data used in an RSA is shown in Table 2. Preferably, any available data should be provided prior to the start-up meeting for review and analysis by the RSA team. This enables the team to familiarize itself with the location, understand potential safety issues, and ask more focused questions at the start-up meeting. Table 2: Potential Data for Conducting RSAs. * Bicycle volumes are beneficial, as they give the context for other data. Site characteristics (road geometry, sight distance, clear zones, drainage, surface condition, signing and marking, lighting, barriers, etc.). Traffic characteristics (traffic/pedestrian/bicycle volumes, movements, speeds, interactions, etc.). Surrounding land uses (including bicycle, pedestrian, and vehicle generators). Human factors issues (such as road user expectancy, reactions, and other behaviors). A team prepares for an RSA on a shared use path. Various conditions—The RSA team should review the site during the daytime and nighttime to experience conditions from the perspective of all roadway users, especially cyclists. This is very important in identifying elements that may increase the risk of cyclists being involved in a collision. The RSA team should walk, bicycle, and drive (if on-road facilities) on or along the cycling facilities and note potential issues with the physical elements, as well as the behavior of cyclists and other road users. The team should ride bicycles that are consistent with equipment used by the cyclists on the facility at speeds that are typical of most riders. (24) The team should also ride in groups or individually based on prevalent conditions. Varying from typical conditions may hinder observation of potential safety issues as encountered by the cycling population. The field review should also include visits during both peak and non-peak traffic conditions. Cyclist safety, mobility, and access are heavily influenced by traffic conditions and issues may change depending on various traffic conditions. In general, RSAs should consider traffic flow periods, lighting conditions, and other time of day or potentially day of the week factors and plan site visits accordingly to observe conditions during periods of elevated crash potential. Visibility of cyclists, especially at night—Bicycles are vehicles and are almost always permitted to travel along the same roadways as motor vehicles. However, bicycles have a slender profile that reduces their conspicuity to motorists. Additionally, although required by law to have lighting, bicycles are generally not equipped with the same lighting features used by motor vehicles to see and be seen at night. During nighttime or low-lighting conditions, cyclists may not be conspicuous to motorized traffic due to bicycle factors but also to roadway lighting factors, such as maintenance of lighting, lighting output, and spacing of lighting. The effect of these factors on the safety of cyclists should be investigated by the RSA team. Wide range of cyclist abilities—A wide range of cycling skills, capabilities, and comfort levels must be considered. The RSA team should be aware of differentials in cognitive and mobility levels across several age groups, particularly when children use the facility. For example, skilled cyclists may have a better understanding of lane positioning techniques than less skilled cyclists (see Figure 14). Figure 14. Techniques to Minimize Sight Distance Issues for Cyclists. Cyclists who ride near the edge of the roadway through curves (diagram left - rider A) will have less sight distance than those riding away from the pavement edge (diagram left - rider B). (25) This technique may be particularly critical for maintaining visibility at unsignalized intersections (diagram right). Expectancy of cyclists by motorists—Drivers who are focused solely on vehicular traffic and associated traffic controls may not give the appropriate attention to other road users, particularly cyclists and pedestrians. At intersections, drivers typically consider conflicting vehicular traffic and may not look for bicyclist traffic, especially when cyclists are approaching from different directions than motor vehicles. Cyclists may not ride in mainstream traffic but rather along the roadside or edge of a travel lane where a vehicle to the left of the cyclist may obstruct the view of other turning vehicles. Also, cyclists may be positioned in the blind spots of same-direction right-turning vehicles. Figure 15 depicts a range of typical issues for cyclists with respect to driver visibility and consideration of bicycle activity. The RSA team should examine the interaction of drivers and cyclists to determine if they are using effective scanning techniques and establishing visual communication with other modes. The prompt lists are designed to be used during the field review to remind the RSA team of numerous aspects of cyclist safety. 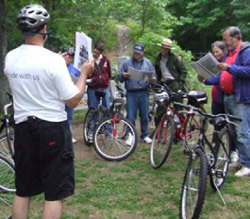 This includes a review of the prompt lists by the RSA team in the field for each type of cycling facility encountered, annotating any issues on paper and with photographs. A more detailed description of the organization of the Guidelines and prompt lists and how to use them is provided in Chapter 4. Figure 15. RSA Considerations with Respect to the Expectancy of Cyclists by Motorists. The RSA team should conduct an analysis to identify safety issues based on data from the field visit and preliminary documents and prepare a report of the findings. Identification of safety issues should not be solely based on cyclists. Safety issues affecting all roadway users should be acknowledged and considered in this process. The safety issues may be prioritized by the RSA team based on the documented (through crash data, exposure analyses, etc.) or perceived risk. Perceived risk may be based on the expected crash frequency and the expected severity of a crash. Expected crash frequency is qualitatively estimated on the basis of expected exposure (i.e., how many road users will likely be exposed to the identified safety issue) and probability (i.e., how likely is it that a collision will result from the identified issue). Expected crash severity is qualitatively estimated on the basis of such factors as anticipated speeds, expected collision types, and the likelihood that vulnerable road users will be exposed. These two risk elements (frequency and severity) may be combined to obtain a qualitative risk assessment on the basis of the matrix shown in Table 3. For each identified safety issue, the RSA team generates a list of possible measures to mitigate the crash potential and/or severity of a potential crash. Measures should consider engineering, education, enforcement, and emergency medical services, or any other actions that may be beneficial to user safety on the facility. The RSA team should prepare a report that includes a brief description of the project, a listing of the RSA team members or agencies participating in the RSA, a listing of the data and information used in conducting the RSA, and a summary of findings and proposed safety measures. The report should include pictures and diagrams that may be useful to further illustrate the issues and countermeasures. The RSA findings and potential opportunities for improvement are presented to the owner/design team. The purpose of this meeting is to establish a basis for writing the RSA report and to ensure that the report will adequately address issues that are within the scope of the RSA process. This is another opportunity for discussion and clarification. The project owner/design team may ask questions to seek clarification on the RSA findings or suggest additional/alternative mitigation measures. At the conclusion of this step, the RSA report can be finalized by the RSA team. Once the owner and/or design team have reviewed the RSA report, they should prepare a written response to its findings. The response should outline what actions the owner and/or design team will take with respect to each safety concern listed in the RSA report. The RSA findings may be presented in a public meeting or the report could be made available to the public to build support for the findings and the overall RSA process. After the response to the RSA report is prepared, the project owner and/or design team should work to implement the agreed-upon safety measures or create an implementation plan. Implementation of the suggested measures is at the discretion of these parties based on their project schedules and available funds. Ensuring the needs of all roadway users are considered—Whereas the focus of these Guidelines and materials is on cyclists, it is paramount that the needs of all users are considered when conducting an RSA. This includes not only understanding design principles but also the laws that affect all users. Failure to consider all users appropriately may result in potential safety issues going unnoticed by the RSA team. Identifying effective measures for cyclists—RSAs not only are used to identify and define issues but to provide suggestions for addressing safety concerns. Mitigation measures and strategies may be categorized as near-term (e.g., signing, pavement markings, and maintenance activities), intermediate (e.g., projects involving construction but no additional right-of-way, such as intersection improvements), or long-term (e.g., right-of-way acquisitions for off-road paths). Significant reductions in cyclists’ exposure or crash risk may require measures that are not feasible in the near or intermediate term, such as developing a larger network of bicycling facilities. For this reason, the RSA findings should recognize and promote ways to accomplish greater benefits through the long-range planning process to comprehensively address cyclist safety when future opportunities arise. 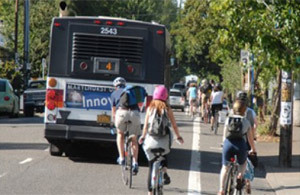 Overcoming opposition to cycling accommodations—It is a goal of the USDOT to have fully integrated active transportation networks, including well-connected walking and bicycling networks. (26) Various sections of Title 23, Title 49, and Title 42 of the U.S. Code and the Code of Federal Regulations describe how bicyclists and pedestrians should be included in the planning process and should not be adversely affected by transportation projects. Implementing mitigation measures and strategies identified during the RSA process may be difficult, particularly when funding sources are limited. To address this challenge, the RSA team may need to identify the magnitude and severity of safety issues facing cyclists in the study area while demonstrating the benefits of potential mitigation measures and strategies. Providing RSA training to community cyclists and/or residential participants. RSA training can be provided to community participants before the RSA. Some agencies have trained community members who “volunteer” to participate on RSA teams. Holding a public meeting prior to the RSA to inform the public of the RSA and to receive input from community cyclists and/or residents. Comment cards and diagramming of known issues can be completed at the public meeting and then presented during the RSA kick-off meeting. The intent of the prompt lists are to assist RSA team members in identifying potential safety issues affecting cyclists and gain a more detailed understanding of conditions contributing to these issues. The RSA team should be familiar with the references and principles described in Chapter 2 before using the prompt lists. The prompt lists are a useful tool to help RSA teams identify the range of design, operational, behavioral, and policy elements that may affect cyclists’ safety. RSA teams should not rely on the prompt lists as a simple yes/no checklist or assume the list covers all issues affecting the safety of cyclists. Rather, the list is intended to “prompt” the members’ thoughts and judgment. It is the responsibility of the RSA team to address cyclist safety in a realistic and thoughtful manner, using the prompt lists as a guide to help address a potentially wide range of issues, including issues unique to a specific area. Master Prompt List—presents the general considerations for cyclists in the RSA process and serves as an outline for the detailed prompt lists. The master prompt list is the least detailed, consisting of 12 major topic areas and 5 RSA zones. Detailed Prompt Lists (Sub-prompt)—presents a more detailed list of considerations for the RSA team. The detailed prompts are organized by zone, as follows. 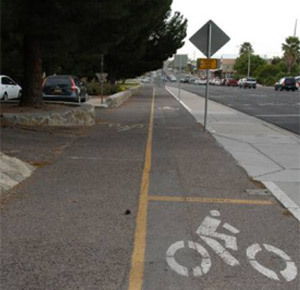 Section A: Street or Path—describes potential issues on streets, trails, or paths that are used by cyclists. Section B: Structures—describes potential issues regarding riding on bridges, in tunnels, or on other structures that may limit the dedicated width, limit the visibility of other users, or lower the expectancy of the presence of other users. Section C: Intersections, Crossings, and Interchanges—describes potential issues where cycling routes intersect with each other or a facility designated for other modes of travel. This may include intersections of streets or paths, railroad crossings, or crossings at interchanges. Section D: Transitions—describes areas where designated cycling facilities transition from one type to another, such as from an off-street path to an on-street facility. Some of the issues that may occur at transitions are also covered in Sections A and C; however, more detailed site-specific issues are discussed in this section. 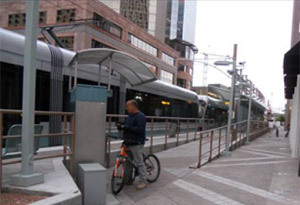 Section E: Transit—describes potential issues specific to transit locations (e.g., bus stops and light rail stops). Particular emphasis is placed on issues at bus stops, as this transit mode is most used and most frequently interacts with cyclists. Figure 16 shows an example prompt list with an annotated key to introduce users to the structure and level of detail. Figure 16. Prompt List Key. The detailed prompts, or sub-prompts, are accompanied by descriptions for the RSA team’s consideration. These may be further categorized as on-road or off-road accommodations (see Glossary of Terms in Section 1.6); however, if these categories are not used, the prompt refers to all facilities. Review of project information and design drawings. Field reviews and site visits. Review of RSA results and suggestion development. All items on the master prompt list should be reviewed for all RSA stages. Projects in the planning or preliminary design stages are less detailed, typically resulting in an RSA that addresses only general issues (such as whether separated facilities can or should be provided). As the design progresses, more detail is available in the design drawings; therefore, the RSA should consider more detailed elements (such as actual bikeway width). 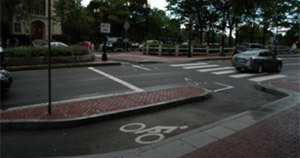 For RSAs of existing facilities, the RSA team must consider these same detailed elements, as well as review the condition of existing infrastructure (such as the condition of the biking surface) and behavioral patterns (such as cyclists riding in the correct direction on bicycle lanes). The prompt lists are designed to assist RSA team members, with varying degrees of experience, in identifying cyclist safety issues. Inexperienced RSA team members may find the detailed prompt lists more helpful than RSA team members with more experience. The experienced team members may focus more on the master prompt list. However, before conducting an RSA, all members should familiarize themselves with the prompt lists. Topic 1—Presence and Availability: Are cyclists accommodated? Topic 2—Design and Placement: Are design features present that adversely impact the use of the facility by cyclists? Topic 3—Operations: Are there suitable provisions for cyclists given the characteristics of the roadway or path (speed, volume, traffic, and functional classification)? Do access management practices detract from cycling safety? Topic 4—Quality and Conditions: Is the riding surface maintained free of debris and/or hazards? Is drainage adequate on the riding surface? Are drainage grates designed for cyclists? Topic 5—Obstructions: Are there any horizontal or vertical obstructions (temporary or permanent) along the facility? 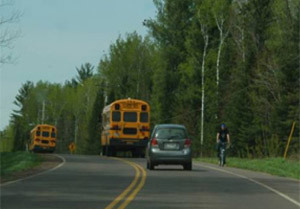 Topic 6—Roadside: Is the clear zone for cyclist’s operating space adequate? Topic 7—Continuity and Connectivity: Are accommodations for cyclists continuous? Do accommodations for cyclists provide adequate connectivity to major destinations? Topic 8—Lighting: Is the riding surface adequately lit? Topic 9—Visibility: Is visibility of the cyclists using the facility adequate from the perspective of all road users, and vice versa? Topic 10—Signs and Pavement Markings: Are signs and markings along the riding surface visible, well-maintained, easily understood, and adequate? Topic 11—Signals: If bicycle detection is present, is it properly positioned, functioning, and effective? Does the traffic signal design accommodate all users? Topic 12—Human Factors/Behavior: What are all roadway users (vehicles, bicyclists, pedestrians, transit, etc.) doing with regard to bicycle traffic, and what are cyclists doing with regard to all other roadway users? Do roadway user behaviors increase crash risk? Topics 1 and 12 form the “bookends” of the prompt lists. They describe potential issues at their fundamental stage—infrastructure and behavior—and are described in detail in the following sections. Cyclists should be provided a complete bicycle network that offers safe routes to destinations. However, not every roadway is designed to accommodate cyclists. Cyclists (and other non-motorized traffic) are typically not permitted on freeways, although they may have a separated, parallel route. On the other hand, facilities for cyclists may be provided that are not appropriate for the land use, roadway classification, traffic speed, composition, or volume context. As a result, safety may be compromised for cyclists who choose to use the facility and deprive other cyclists of direct and efficient bicycle routes to destinations. While it is beyond the ability of the RSA team to investigate cyclist safety at the network level, the team should be able to assess the appropriateness and safety of facilities for cyclists on the roadway that is the subject of the RSA. In addition to subject roadways, the team may need to assess the appropriateness and safety of facilities for cyclists on nearby and parallel routes or transition areas between cycling facilities outside of the defined study area. 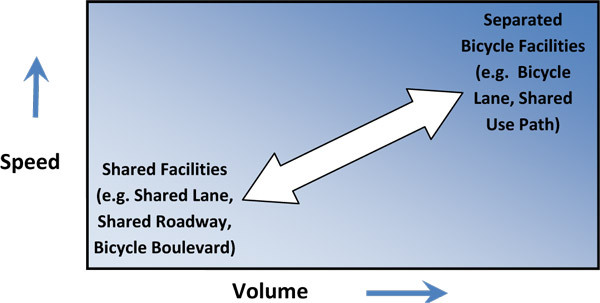 Figure 17 indicates the suggested bicycle facility treatment for roadways as a function of the relationship between vehicle speed versus volume. As depicted in Figure 17, in general, separated facilities are appropriate for high-speed, high-volume roads (see darker area in diagram) while shared lanes are appropriate on low-speed, low-volume roads (see lighter area in diagram). Some roads may have characteristics that require a more detailed understanding of conditions to determine the appropriate accommodation for cyclists (see area in between). For example, on low-speed, high-volume roads bicycle lanes can encourage conflicts since cyclists may be traveling as fast or faster than motor vehicles placing cyclists into static or moving blind spots. Human factors and behaviors are a contributing factor in most crashes involving motor vehicles. Crashes involving cyclists are no different. The RSA team should observe the behaviors exhibited by motorists, pedestrians, and cyclists and investigate the reasons those behaviors are practiced. The RSA team should use the prompts in Table 4 to investigate and assess whether cyclist, pedestrian, or driver behavior increases the risk of a collision. If undesirable behaviors are present, there may be a need for additional enforcement, training, and education, as well as improvements in infrastructure where roadway design, operations, or traffic factors may be contributing to these behaviors. Observing the behavior of cyclists is essential to understanding the conditions that affect the safety of cyclists. Some cyclists may feel more comfortable riding on the sidewalk due to roadway conditions. Table 4: Prompts to Use when Assessing Cyclist and Other Road User Behavior. Do roadway users look/scan for other travel modes? Are roadway/path users courteous to each other? Allow extra space or reduce speed as needed when overtaking or driving near bicyclists? Look for and yield to bicyclists before changing lanes, turning, parking or opening car doors? Avoid loud horn blasts when overtaking or driving near bicyclists? Watch for cyclists needing to merge and allow space for them to do so? Give an alert call or signal (such as using a bell) when passing pedestrians or other bicyclists on shared use facilities? Ride at a safe speed and follow safe practices for the conditions? Slow down for pedestrians and wait for a safe passing opportunity? Stop at intersections when required to do so? Avoid abrupt changes in direction? Avoid stepping out in front of cyclists without looking? Keep dogs on leashes and out of the way of other path users? Use special lanes (e.g., bus/bicycle-only lanes, drop-off zones, etc.) appropriately and safely? Do motorists follow traffic laws and rules of the road? Obey posted speed limits and local ordinances? Avoid unsafe overtaking or passing cyclists too closely? Check for and yield to through cyclists before turning right, either from a stopped position or after overtaking a bicyclist traveling to the right? Avoid passing left-turning cyclists on the left? Use proper signals to indicate intentions? Obey traffic controls including signs, signals, and pavement markings? Look in both directions and yield to bicyclists and other traffic when turning and entering and exiting the roadway? Avoid parking in bicycle lanes or double-parking? Yield to opposing bicycle traffic when turning left under a green signal? Do bicyclists observe the rules of the road and other safe riding practices? Travel with the flow of traffic? Position themselves properly in the lane/path? Consider the conditions present, such as narrow lane widths, on-street parking, turning conflicts, poor sight lines, and pavement conditions? Make left turns from the appropriate lane? Check for approaching traffic, including pedestrians on walkways, and yield before entering/crossing a roadway at any type of junction (intersection, driveway, or shared use path)? Understand and obey the posted traffic control devices and local ordinances? Check behind for traffic before changing lanes or merging with traffic on a different traveled way? Use proper hand signals to indicate turning or stopping intentions? If bicycle restrictions are present, do cyclists adhere to those restrictions and only use permitted areas or facilities? Avoid passing traffic on the right and occupying blind spots where they may face conflicts with right-turning motorists? Transport children using proper child seats and helmets? Do bicyclists ride on the sidewalk? Does sidewalk riding contribute to conflicts with motor vehicles at intersections and driveways? Do cyclists dismount and avoid cycling on sidewalks in high-pedestrian traffic areas? Does sidewalk riding contribute to conflicts with pedestrians? Are bicyclists practicing methods to increase their conspicuity at night? Are bicycles and bicyclists properly equipped with active, white headlamps and rear, red taillights? Do bicyclists supplement required lighting and reflectors with retroreflective gear and clothing at night? Are design features present that adversely impact the use of the facility by cyclists? Are bridges/tunnels designed with adequate bicycle accommodations on both sides? Does the gradient of the cycling accommodations impact the use of the facility? Are intersection/interchange accommodations designed to reduce conflicting movements and communicate proper bicycle positioning through the crossing? Are transition areas designed with logical termini or do they end abruptly, potentially contributing to sudden and difficult merges, midblock crossings, or behaviors such as wrong-way riding? Are transit facilities designed and placed to minimize conflicts with other modes? Are there suitable provisions for cyclists given the characteristics of the roadway or path (speed, volume, traffic, and functional classification)? Do access management practices detract from cycling safety? Do traffic operations (especially during peak periods) create a safety concern for cyclists? Do shared roadway geometrics change substantially or frequently? Are transit facilities designed and placed to minimize conflicts with other modes? Is the riding surface smooth, stable, and free of debris and is drainage adequate? Are drainage grates designed for cyclists? Is the grating/bridge surface designed for cyclists? Is drainage adequate to accommodate bicyclists? Are there longitudinal or transverse joints that may cause cyclists problems? Are there any obstacles at crossings? Are the manhole covers properly designed? Is there an abrupt change in riding surface? Are transit stops maintained during periods of inclement weather? Are there any horizontal or vertical obstructions (temporary or permanent) along the facility? Is there adequate horizontal and vertical clearance? If bollards or other physical terminal devices are used, is the risk of occasional motorized vehicles greater than the risk of a fixed object within the travel way? Is the waiting area free of temporary/permanent obstructions that constrict its width or block access to the bus stop? Is the clear zone for cyclists’ operating space adequate? Are railings, guardrail, and/or parapets and other structures installed at an appropriate height and shy distance? If bollards or other physical terminal devices are used, is the risk of occasional motorized vehicles greater than the risk of a fixed object within the travel way? Are bicycle accommodations connected and convenient for transit users? Do bicycle accommodations provide adequate connectivity to major destinations? Are bicycle accommodations continuous, or do they end abruptly at bridge/tunnel crossings? Are bicycle accommodations continuous, or do they end abruptly at crossings/intersections/interchanges? Is there a safe way for cyclists from both directions to access connections or continue to other destinations along the street network? Are crossings convenient and free of potential hazards for cyclists? Is the riding surface adequately lit? Are bridges and tunnels adequately lit? Are the intersection/transition and paths leading to the transition adequately lit? Are transit access ways and facilities adequately lit? Is the visibility of cyclists using the facility adequate from the perspective of all road users? Can cyclists see approaching vehicles/pedestrians, and vice versa? Can cyclists see approaching vehicles/pedestrians at all legs of an intersection/crossing, and vice versa? Is the visibility of cyclists as they make the transition from one facility or roadway geometry to another adequate from the perspective of all road users? Is the visibility of cyclists using the facility adequate from the perspective of all road users? Are signs and markings along the riding surface visible, well-maintained, easily understood, and adequate? Are adequate warning signs posted at entrances? Do signs and markings along the cycling facility clearly indicate the cyclist path and right-of-way at intersections? Are signs and markings at transition areas appropriate? 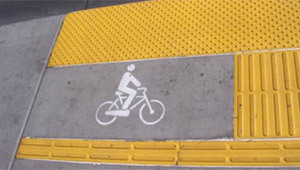 Are signs and markings at designated areas for cyclists using transit appropriate? If bicycle traffic signalization and detection are present, are they properly positioned, functioning, and effective? Does the traffic signal design accommodate all users? What are all roadway users (vehicles, bicyclists, pedestrians, transit, etc.) doing with regards to bicycle traffic, and vice versa? A.2: Are design features present that adversely impact the use of the facility by cyclists? A.2.1: Do accommodations for cyclists conform to the state of practice, guidelines, and relevant standards, or are there more advanced designs that would better support and enhance conditions for cycling? While an RSA is not a standards check, it is critical that some RSA team members have an understanding of design requirements for cycling facilities as well as an understanding of the relative safety benefits that various design features may provide. AASHTO’s A Policy on Geometric Design of Highways and Streets (“Green Book”). AASHTO’s Guide for the Development of Bicycle Facilities. NACTO Urban Bikeways Design Guide. Knowledge of the information contained in these resources will help RSA team members check for conditions that may present a safety issue for cyclists, especially under challenging conditions (e.g., night, adverse weather, high vehicle speeds, multiple conflicts, etc.). Chapter 1 provides a more complete list of resources. A.2.2: Are there adequate cycling provisions on both sides / directions of the roadway? On-road accommodations: accommodations for cyclists are needed on both sides of a two-way roadway and certain one-way roadway pairs of streets to accommodate desire lines of cyclists. 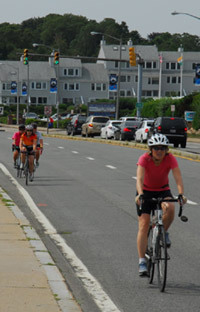 Aside from issues of continuity and connectivity (see A.7), conflicts arise when two-way accommodations for cyclists are not present (see photo, left). Cyclists are encouraged to ride against traffic. Cyclists and pedestrians traveling opposite directions are subject to conflicts on the shoulder. Some cyclists approach intersections and driveways from the right, creating an expectancy conflict with motor vehicle traffic. Connectivity to destinations on the opposite side of the road is not provided, potentially resulting in unpredictable maneuvers by cyclists. A.2.9 shows two-directional travel for bicycles maintained with a counterflow bicycle lane. Off-road accommodations: facilities should allow for two-way travel that considers conflicts with other road users and desire lines of cyclists. Separated bicycle facilities may take the form of two, one-way paths or two-way paths. Priority should be carefully considered at side street crossings, especially for two-way paths. Continuity and connectivity (see A.7) with other types of facilities are also potential safety concerns. A.2.3: Does the design consider prevailing speeds of cyclists and comfort? On-road accommodations: steep downgrades and lack of superelevation may contribute to loss of control issues for even the most experienced bicyclists. This may be a particular issue on rural roads where cyclists may be accommodated by a shoulder. Off-road accommodations: consideration should be given to the adequacy of horizontal curves, hill crests, and sag curves, especially curve and grade combinations that make the path difficult or uncomfortable to ride (i.e., a sharp horizontal curve at the bottom of a steep downgrade). A.2.4: Would bicycle lanes or separated facilities improve conditions for cyclists and if so, is there adequate separation between vehicular and bicycle traffic? On-road accommodations: as shown in Figure 17, shared lanes are typically appropriate on low-speed, low-volume roads. Bike lanes or separated facilities may be more appropriate on high-speed, high-volume roads. Adequacy of the separation distance of these facilities is a function of vehicle speed, volume, and composition. Beyond meeting minimum standards, the width of on-road facilities should consider the wind impacts from passing heavy vehicles. The high-speed roadway in the photo to the left has a wide bicycle lane designated by an 8-inch longitudinal marking and arrow/symbol pavement markings. A.2.5: Is there adequate space and accommodation for bicycles? On-road accommodations: bicycle accommodations should consider the full operating width of cyclists, not just the physical width. The operating width for cyclists may increase because of speed, wind, bicyclist’s handling skills or shy distance from curbs, gutter pans, drop-offs, guard rails, railing, car door swing, and other features. 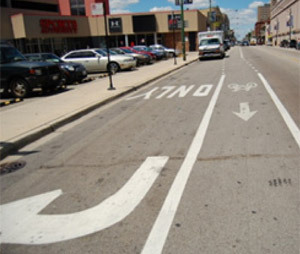 The top photo to the left illustrates a bicycle lane with a striped buffer area between the bicycle lane and moving traffic (note that combined use of solid and dashed lines for a bicycle lane does not conform to the MUTCD). This bicycle lane is located on the left side of a one-way street to minimize door conflicts with parked vehicles and to avoid conflicts with buses. Off-road accommodations: the full operating width of cyclists should be considered with regard to interactions with pedestrians and other path users. Operating space should be consistent and free of choke points or obstacles that limit space (see also B.6). The photo on the bottom left shows a shared use path that narrows at a transition to a bridge, creating a choke point. This design may increase conflicts between path users. The type of users should also be considered (i.e., less experienced cyclists may need additional width for passing and other maneuvers than more experienced cyclists and areas with a high bicycle trailer usage may increase the need for additional width). 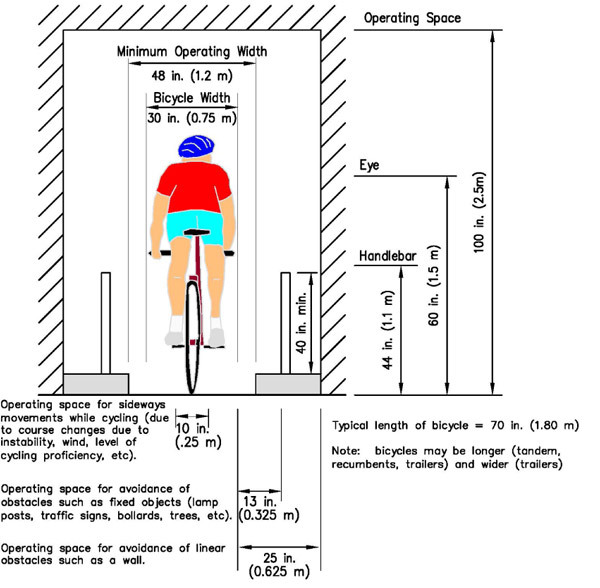 Figures 3 and 4 describe operating space and the lengths and widths of bicycles. A.2.6: Could the gradient impact cyclists? Cyclists on ascent up a steep grade may need additional operating width because of the greater speed differential from motor vehicle speed and because bicycles are less stable at low speeds. Cyclists on steep descents need greater stopping sight distances and separation from other users due to higher speeds. 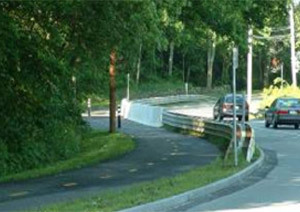 The photo to the left shows a shared use path with a wide climbing lane to allow cyclists to pass slower cyclists, but does not provide additional space for cyclists on the downgrade. This is particularly critical given that there is a horizontal curve at the bottom of the hill. Since cyclists can travel at high speeds on steep descents, curves and structures at the bottom of hills should accommodate higher design speeds. 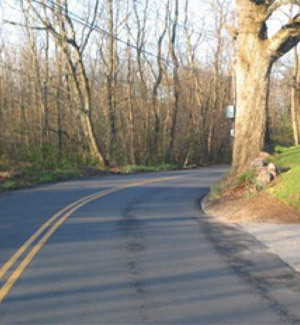 Pavement conditions (e.g., debris) or conflicts at the bottom of gradients can increase risk. A.2.7: Do traffic calming measures and traffic management practices allow for safe and efficient cycling operation? Typically, traffic calming measures (e.g., chicanes, curb extensions, and road diets) are utilized to encourage slower motorized vehicle speeds and create a more uniform speed profile. Cyclists can benefit from this reduction in vehicle speeds if the space for riding is adequately maintained by these measures. Traffic management refers to measures that divert motorized traffic to other adjacent facilities (e.g., bicycle boulevard, partial diverters, etc.). These devices should enhance cycling safety by providing well-defined riding areas and path connections. A.2.8: Do rumble strips present a detrimental surface condition to bicycles? Is the usable width of the shoulder reduced? Are regularly-spaced breaks in the rumble strips provided for a cyclist to traverse rumble strips? Are longer gaps provided on downgrades? Do rumble strips stop in advance of intersections and crossovers to allow lane changes in advance of turns? If centerline rumble strips are present, is the riding surface wide enough to allow vehicles to pass cyclists with adequate clearance and without crossing the centerline? A.2.9: Does parking adversely affect cycling safety? Pull-in/angle parking may lead to conflicts with cyclists when vehicles back up because awareness and visibility of approaching cyclists on the roadway may be restricted or obstructed by other parked vehicles. Back-in/head-out angle parking provides improved visibility of approaching cyclists on the roadway, as a driver has much better visibility when exiting. Encroachments, double parking, and illegal parking can contribute to cyclist conflicts with other users. The photo to the left shows a counterflow bicycle lane through a neighborhood. The counterflow lane is within the door zone of parked vehicles. Consideration should be given to the ability of cyclists riding in bicycle lanes (with traffic and counterflow to traffic) to keep out of the door zone of parked vehicles without deviating from the lane. Also note that the counterflow bicycle lane and the vehicle travel lane provide two-direction access to cyclists (see A.2.2). A.3: Are there suitable provisions for cyclists given the characteristics of the roadway or path (speed, volume, traffic, and functional classification)? Do access management practices consider cycling safety? A.3.1: Is the type of cycling accommodation appropriate for the roadway context? Consideration should be given to the roadway functional classification, vehicle speeds, traffic volumes, vehicle classification, use and/or designation of the bicycle route, and access to cyclist destinations to determine if the type of accommodation is appropriate. A cyclist should have adequate space to operate based upon the prevailing conditions (see Figure 17). A.3.2: Is the type of cycling accommodation appropriate for the primary or intended users? Bicycle accommodations should match the needs of the intended users. Cyclists, particularly less-experienced cyclists, may prefer greater separation from vehicular traffic, especially as speeds and volumes increase. Particular attention should be given to routes that access schools, parks, and other public spaces that will be frequented by children and families. A.3.3: Are driveways designed with cyclists in mind? Driveways and entrances should be well-defined and clear of obstructions so that driver and cyclist actions are consistent and predictable. Multiple driveway access points increase the number of conflict points for cyclists (see C.2.2 and C.2.3). Poor access management may encourage cyclists to use sidewalks instead of on-road facilities or take alternative routes that may also have safety issues. A.4: Is the riding surface smooth, stable, and free of debris, and is drainage adequate? Are drainage grates or manholes located in the cyclists’ path of travel? A.4.2: Does debris accumulate in the area used (or intended for use) by cyclists? Dirt, litter, glass, etc. may accumulate where cyclists travel. This debris may puncture tires or cause a loss of control, especially on a downgrade or curve. Consideration should also be given to the material adjacent to a facility used by cyclists, as these should be free of lose materials that can move onto a path. 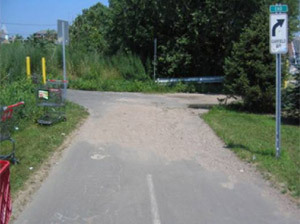 The photo to the left shows a gravel driveway that has partially covered the bikeable shoulder. Loose gravel can cause a cyclist to lose stability and fall. Surface conditions that may present existing or future issues to cyclists should be considered. A.4.3: Is vegetation narrowing the rideable width or affecting the surface quality? Grass and fast-growing vegetation may narrow the travel way and interfere with cyclists, causing them to make avoidance maneuvers that may put them into conflict with other roadway or path users. Off-road accommodations: Tree roots and other heavy growth may damage the riding surface, which can lead to a loss of control. A.4.4: Are there potholes or other surface defects? Facilities used by cyclists should be smoother than those deemed acceptable for motorized traffic. 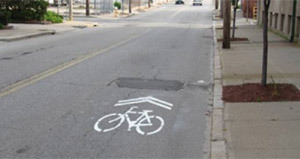 Potholes, cracks (especially longitudinal cracks), buckling from heavy vehicle use, and lips at surface transitions along the riding surface are surface defects that may cause cyclists to lose control or fall. A continuous presence of these surface defects may cause cyclists to ride outside of the intended path of travel. he photo to the left shows a Shared Lane Marking (SLM) with a roughly patched pothole just beyond it. 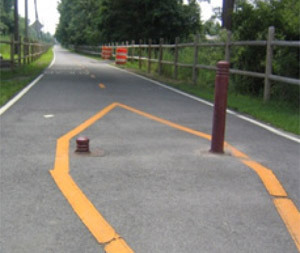 Cyclists may divert from the marked path to avoid surface irregularities such as these. A.4.5: Are drainage grates or manholes located in the cyclists’ path of travel? Recessed manholes, drainage grates, or utility covers may increase the potential for tire and wheel damage. Consideration should be given to the use of drainage grates that are “bicycle compatible” with transverse openings of an acceptable gap. 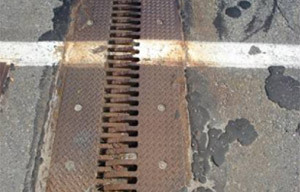 The grate pictured at the left has both longitudinal openings and is damaged, both of which could present a significant issue to a cyclist (see B.4.1). A.4.6: Are there longitudinal joints or cracks that could trap a wheel? Deep longitudinal joints or cracks may “grab” a tire and potentially cause loss of control (see also B.4.3). 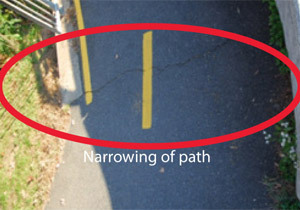 The photo to the left shows a longitudinal joint at the cold joint between pavement surfaces that may cause a cyclist to lose control and fall. A.4.7: Does ponding of water occur in the cyclists’ path of travel? Standing water can cause cyclists to make sudden changes in their path of travel and may conceal potholes or other defects. Debris may also collect in areas where there is poor drainage and cause cyclists to slip (see also B.4.2). The photo to the left shows debris across the cycling facility that has been carried by storm water and deposited at the location due to poor drainage. A.5: Are there horizontal or vertical obstructions (temporary or permanent) along the facility? A.5.1: Are sign faces, including temporary construction or detour signs, mounted away from the operating space? Specifically, post-mounted signs shall be mounted at least 4 feet above and 2 feet beyond the edge of the bicycle facility (i.e., such that no portion of the sign or its support is within 2 feet of the edge of the bicycle facility). If the sign is overhead, the sign shall be mounted at least 8 feet above the facility, and there shall be at least 2 feet of horizontal clearance between the pole and the edge of the bicycle facility. The stop sign shown in the photo to the left is not installed at the appropriate offset or height from the pavement edge, increasing the potential of a sign strike. Visibility of the sign is also obstructed by the fence and box. 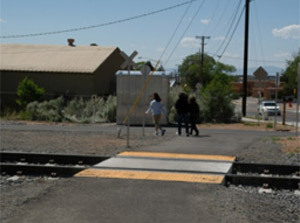 Placement of the fence adjacent to the path also restricts usable space (see A.2.5, A.6.1, and, for at-grade railroad crossings, C.2.6). A.5.2: Do vegetation or other obstructions encroach into the cycling operating space? 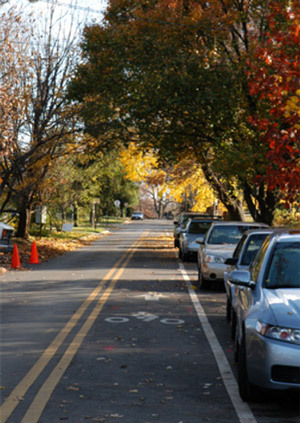 Fast-growing vegetation, tree branches, bushes, or root damage to pavement may interfere with cyclists’ operating space and cause riding into the vehicle travel lane, opposing pathway, or designated space for other users. A.6: Is the clear zone for cyclists’ operating space adequate? paths adequate? Clear zones should be maintained to provide an adequate level recovery area and unobstructed sight distance for prevalent bicycle speeds. The clear zone should be free of signs, fences, non-traversable landscaping, and loose materials that act as fixed objects or that can destabilize a cyclist. Clear zone guidance is provided by AASHTO (see also A.5.1). A.6.2: Do slopes in the clear zone pose a safety issue? Graded shoulders provide a recovery area for cyclists. Steep slopes and drop-offs should be outside the clear zone. Clear zone guidance related to slopes is provided by AASHTO. The photo to the left shows a shared use path with an unprotected, sharp drop-off that is non-traversable by cyclists. A.7: Are bicycle accommodations continuous? Do bicycle accommodations provide adequate connectivity to major destinations? A.7.1: Are cycling routes or facilities continuous? A network of bicycle-friendly roadways and paths is critical to provide cyclists with continuous and direct access to destinations. Gaps, lack of facilities, or facilities inappropriate for the context may result in indirect routes to destinations and possibly illegal or undesirable behaviors, such as riding against traffic and riding on sidewalks to reach destinations (see D.2). A.7.2: Are there frequent changes in the geometrics or accommodations provided for cyclists? Frequent or sudden changes in geometrics or accommodations can cause conflicts with other users, particularly in high volume, high-speed corridors (see D.2). Examples include drops of shoulders or bicycle lanes and reductions in path widths. Unexpected changes when traveling at higher operating speeds may lead to severe crashes. A.7.3: Is access provided to primary destinations? Consideration should be given to primary destinations for cyclists (e.g., work, school, church, parks, restaurants, etc.). Lack of appropriate access and accommodations for cyclists affects their safety within the roadway or pathway environment and may contribute to fewer riders due to safety concerns. A.8: Is the riding surface adequately lit? Inconsistent or dim lighting may create shadows, affecting the ability of cyclists to see and be seen. High-risk corridors may need additional lighting, particularly if surrounding land uses are active (e.g., college campus areas). Routes may need to be evaluated seasonally for commuter use in early evening hours and during seasons with heavy foliage or snow. A.9: Is the visibility of cyclists using the facility adequate from the perspective of all road users? A.9.1: Is sight distance an issue? Also, note that increasing sight distance may result in increased travel speeds. The photo to the left shows where horizontal curvature and a limited clear zone result in limited sight distance (see also Figure 14. Techniques to Minimize Sight Distance Issues for Cyclists). A.9.2: Are cyclists riding at the edge of the road or path obscured by vegetation along the roadway edge? 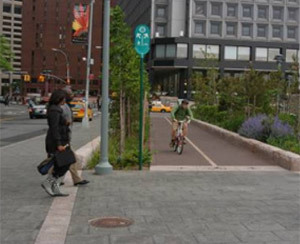 Facilities may be designed in such a way that cyclists ride close to the roadway or path edge. Vegetation and other features may reduce the usable width of the facility. Blend into the surroundings (see also A.8). Make unpredictable maneuvers to avoid vegetation. 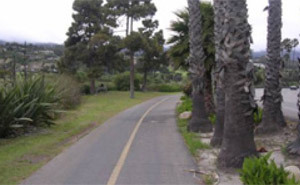 The photo to the left shows heavy vegetation growing close to the path. Cyclists may shy away from this vegetation, which can create conflicts with path users in both directions. This is especially critical given the narrow width of the facility and limited visibility. A.10: Are signs and markings along the riding surface visible, well-maintained, easily understood, and adequate? A.10.1: Are signage and pavement markings clear and consistent along the path or roadway? Regulatory and Warning—Regulatory and warning signs should only be used when needed. Traffic control devices specific to bicycle travel should provide clear and consistent messages so that required actions of all road users are communicated effectively and understood. Wayfinding—When cyclists are fearful of motor traffic, they are more likely to behave in a less safe manner (e.g., riding on the sidewalk, hugging the edge of the road, etc.). Wayfinding can be used to help less confident cyclists avoid busier roads that they might find intimidating. Bicycle route maps may also be used to communicate route information to cyclists. On designated cycling routes, directional, destination, and wayfinding signage and pavement markings should be consistent, well-maintained, and should be readable and visible in all conditions, including at night. Signs that require stopping for reading should not be placed at intersections in or near traffic but rather in other locations where cyclists might stop, such as at tables, water fountains, etc. Trail Etiquette—Signs indicating trail etiquette may be used to communicate trail information to the cyclist. The signs should be concise and readable at bicycle travel speeds. The example in the photo to the left is confusing and is not readable at bicycle travel speeds. Furthermore, the no parking sign discourages cyclists from stopping. A.10.2: Is the spacing and location of signage and pavement markings adequate to communicate the intended use? Too many signs in one location can lead to “information overload,” which can confuse or distract cyclists and other road users. Also, signs intended for cyclists may be misinterpreted for use by other road users. The intersection signage shown in the photo to the left presents road users with multiple messages, which may be confusing or distracting. A.11: Refer to B.11 and C.11 for traffic signal and detection position, function, and effectiveness considerations. B.2: Are bridges/tunnels designed with adequate bicycle accommodations on both sides? Does the gradient of the cycling accommodations impact the use of the facility? B.2.1: Are two-way bicycle accommodations provided? 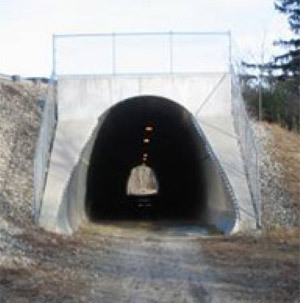 On-road accommodations: bridges and other structures, such as tunnels or culverts, may constrict or terminate designated space for cyclists placing them into conflict with motorists. This may lead to unpredictable maneuvers by cyclists. If accommodations are provided only on one side, is there a means of safe access and departure by bicyclists traveling in the other direction (see also B.5)? Off-road accommodations: separated bicycle facilities may provide two-way travel for cyclists on one side of a structure; however, the continuity of the path should be maintained and conflicts avoided, such as having a two-way bikeway that is not separated from traffic, as well as other conditions described in B.5 (see also A.7). The photo to the left shows abridge that has been retrofitted with exclusive pedestrian and bicycle paths that provides good separation from vehicular traffic. B.2.2: Does the gradient of the cycling accommodations impact the use of the facility? Is there space for vehicles to pass slow bikes on uphill segments? Is there separation between high-speed cyclists riding with or faster than vehicle traffic on downhill segments? B.3: See prompts in A.3 for potential operational considerations affecting the safety of cyclists. B.4: Does the grating/bridge surface pose a hazard to bicyclists? Is drainage adequate to accommodate bicyclists? Are there longitudinal or transverse joints that may cause cyclists problems? B.4.1: Is the riding surface smooth, and does it provide adequate skid resistance? Can grates trap or channelize the front tire of bicycles (see also A.4.5 and A.4.6)? Is timber decking placed longitudinally so as to trap a tire? Are transitions in surface smooth and free from gaps? Note the jagged edge of the plate in the photo to the left resulting from snow plowing. Is skid resistance (i.e., traction) adequate under all weather conditions or are more advanced treatments required? Note also that metal plates can be slippery when damp or wet, especially near waterways. Additionally, movable spans like a drawbridge can bounce significantly under traffic loads, contributing to loss of control for cyclists on the bridge when traction is inadequate. B.4.2: Is drainage adequate, and is the surface free of debris? 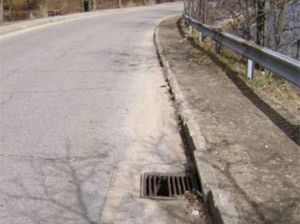 Masked surface defects (e.g., potholes, cracks, lips, etc.). Sediment, which can create a slippery surface. The presence of ponding and draining water may cause cyclists to perform avoidance maneuvers that may conflict with other road users or place the cyclist in an unexpected predicament. Evidence of drainage issues, particularly puddles or sediment from standing or flowing water should be reviewed (see also A.4.7). 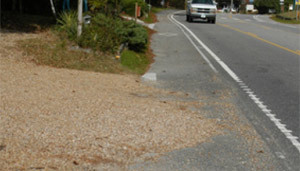 The picture to the left shows sand and road debris cast onto the cycling path from sanding and plowing operations. Sand on the pavement can cause a loss of traction for cyclists. B.4.3: Are there longitudinal or transverse joints that may cause cyclists problems? Longitudinal joints (i.e., parallel to the direction of travel) may trap a front bicycle tire and result in loss of control. Transverse joints (i.e., perpendicular to the direction of travel) may have wide gaps that can trap bicycle wheels, causing loss of control and sudden falls. 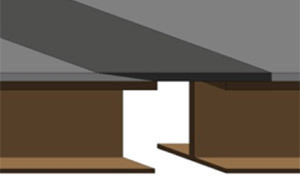 Bridge expansion joints, including finger joints like the one pictured to the bottom right, can have wide gaps that snag a tire or cause pinch flats (tire punctures) and cause a fall. B.5: Is there adequate horizontal and vertical clearance? In areas of low vertical clearance, items protruding into the clear zone (e.g., signs, light fixtures, structural supports, etc.) may not be noticed by a cyclist as they tend to focus on the travel surface. Furthermore, cyclists may change their position on the road or path to maintain comfortable operating space from bridge railings or tunnel walls. On roadways, large vehicles may also need to reposition themselves upon entering a tunnel due to vertical clearance, which can cause shifts in traffic in both directions that can affect cyclists. Considerations with respect to horizontal clearance are discussed in A.2.5. B.6: Are railings, guardrail, and/or parapets and other structures installed at an appropriate height and shy distance? Are there features that can pose a risk to cyclists? 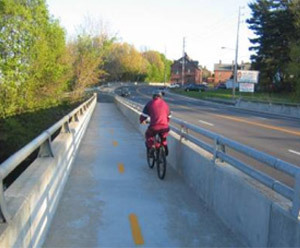 Recommended height and shy distance for railings are detailed in the AASHTO Guide for the Development of Bicycle Facilities, but many variations may occur, especially at locations where ornamental railings may be used. Further consideration should be given to vertical protrusions or bars that can catch or snag a passing cyclist or bicycle and whether the railing presents a greater safety issue than the hazard it is shielding. Blunt ends of railings and other barriers may increase risk to all road users. 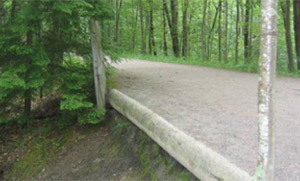 The photo to the left shows a barrier that has guardrail on the side facing the path to prevent snagging. However, guardrail has a sharp edge that may pose an injury risk in the event of a fall. B.7: Are bicycle accommodations continuous, or do they end abruptly at bridge/tunnel crossings? Change in accommodation location both at the structure and on the structure. Changes in useable width (see also D.3, D.7, and D.9). B.8: Are bridges and tunnels adequately lit? Cyclists can see the surface and determine useable space. All roadway users are aware of the presence of others. Transitions from daylight to tunnel or bridge, and vice versa, minimize changes in light so that cyclists and other users do not lose visual acuity (see also A.9). Transitions may be especially critical at an interchange, where lighting conditions may change rapidly due to the presence of an underpass or overpass and complex traffic patterns may be present (see also C.9). In the photograph to the left, cyclists can see daylight at the tunnel end and determine if there are others in the tunnel. Also, for security reasons, cyclists prefer to be able to see daylight at the tunnel end. B.9: Can cyclists see approaching vehicles/pedestrians, and vice versa? User habits, such as cyclists riding side-by-side on off-road paths. Operating speeds of all users. User awareness should also be considered as described in Chapter 3, Figure 14. B.10: Are adequate warning signs posted at entrances? Motorists and cyclists should be aware of each other. Warnings should be clearly visible for all lighting conditions and clearly understood, especially in areas where the useable space may be restricted (see also A.5.1). B.11: If bicycle traffic signalization and detection are present, are they properly positioned, functioning, and effective? Is detection positioned where it can be easily “triggered” by cyclists without having to change their intended route? Are traffic signals and detection functioning properly? Are traffic signals understood by all road users and obeyed? Transitioning to and from bridges and tunnels may involve waiting through long traffic signal cycles. Is there sufficient storage space for cyclists that queue during these transitions? 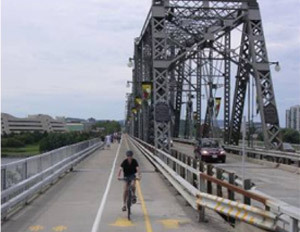 The photo to the left shows a bicycle warning system that is used to alert motorists of the presence of cyclists on a bridge because the bikeable shoulders do not continue over the bridge (see also C.11). C.2: Are intersection/interchange accommodations designed to reduce conflicting movements and communicate proper bicycle positioning through the crossing? C.2.1: Are accommodations properly designed and placed on intersection approaches? On-road accommodations: on-road bicycle lanes must be properly designed and located to encourage proper lane positioning at intersections (i.e., the rightmost lane or portion of lane headed in the cyclist’s direction of travel). 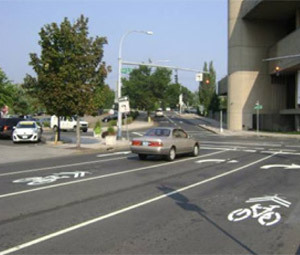 Other considerations when locating a bicycle lane in relation to a turn lane include geometrics, traffic speed, and roadway gradient. 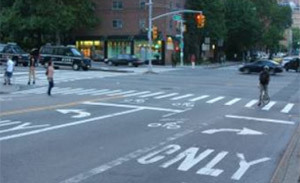 The top photo to the left shows a bicycle lane incorrectly located to the right of a dedicated turn lane, which may contribute to “right-hook” crashes. 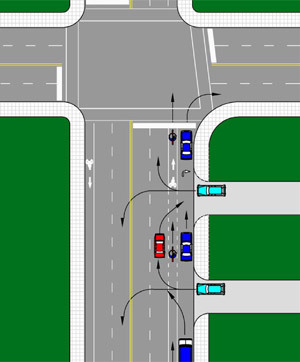 Bike lanes should be placed to the left of a right-turn lane to minimize the opportunity for right hook crashes and permit cyclists to ride through the intersection, as shown in the center photo. The bottom photo to the left shows shared lane markings in the through and the far right right-turn only lane at an intersection on a multilane one way street. Is the major movement assigned right-of-way? Are curb ramps present, and if so, do they extend the full width of the path, with adequate landing area, slope, and a flush surface? Do crossings provide adequate gaps and storage for crossing cyclists, particularly at higher-speed multilane crossings (see also C.2.7)? C.2.2: Are there difficulties for cyclists caused by intersection geometry or lane use assignments? Through lanes that become turn lanes. Shoulder drops to accommodate a turn lane. Bus stops near intersections (see D.2). The photo to the top left shows an acceleration lane with a bikeable shoulder beyond. Bicyclists have difficulty merging with higher-speed vehicle traffic at these locations because they are typically travelling at slower speeds and have a narrower profile, making them more difficult to be seen by accelerating and merging traffic. Lane changes and U-turns to access crossovers. Wide curb radii encouraging high speed turns. Conflicts with continuous or channelized right-turn lanes and weaving traffic. Unclear or long merge areas. The diagram to the bottom left shows how placement of driveways and bus stops may affect the safety of cyclists. As shown in the bottom graphic, drivers entering from side streets or driveways may not see cyclists behind vehicles, especially large vehicles, such as buses. The placement of a bus stop can increase cyclists’ risk (see also E.9). 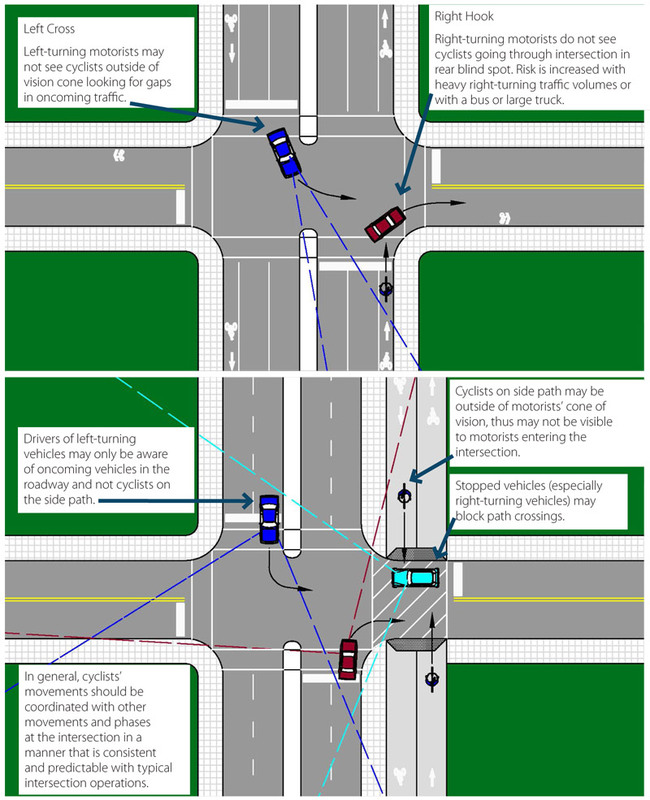 C.2.3: Are cyclists safely accommodated on each approach to an intersection? Storage length, particularly at path crossings. Adequacy of gaps in traffic at unsignalized crossings (see C.2.7 and D.7). C.2.4: Where pedestrian accommodations are present, are cyclists adversely affected? Traffic calming measures (e.g., refuge islands, curb bulb outs, etc.) help manage traffic speeds and can enhance the safety of a roadway for all users. The measures should be designed with cyclists in mind. For example, curb changes should not be abrupt or encroach into the bicycle facility (see D.2). 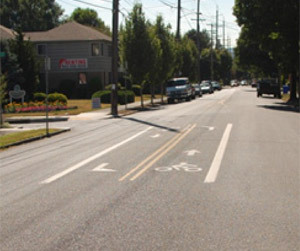 The photo to the left illustrates a curb bulb-out extending into a bicycle lane. C.2.5: Are there any unique intersection characteristics that may pose a problem for cyclists? A skewed intersection can direct a driver’s focus away from approaching cyclists, present sight distance issues, and encourage higher speed movements through an intersection. Roundabout design should pay particular attention to properly accommodating cyclists and should consider interactions and transitions for all modes. Vehicle volumes and speeds should be considered when evaluating appropriate bicycle accommodations in roundabout design. It is important to consider whether the transition meets the safety needs of all users (see D.7). C.2.6: Do at-grade railroad crossings safely accommodate bicyclists? Railroad crossings with skewed tracks can result in an increased crash risk for cyclists. Preferably, cycling facilities should cross railroad tracks as close to perpendicular as practical. Longitudinal tracks and very acute crossing angles over tracks can trap bicycle wheels. Additionally, crossing surfaces can be slippery in wet weather, especially when slip-resistant measures are not used (see B.4.1 and D.4). Good pavement conditions, extra paved width to allow crossing closer to perpendicular, and flangeway fillers help minimize risk on low-speed, low-train-volume tracks. 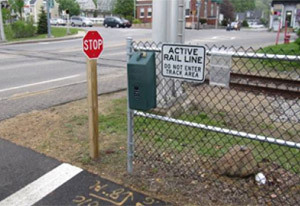 The photo to the left illustrates a shared use path crossing of a railroad track. Trains in the area are infrequent and pass through the corridor at low speeds. C.2.7: Do facilities avoid or minimize the need for the cyclist to slow down or stop unnecessarily? On-road accommodations: cyclists on the road are subject to the same rules that govern vehicles, and therefore, they must obey traffic control devices that require vehicles to stop or slow down. Off-road accommodations: cyclists on off-road separated facilities (e.g., side paths and shared use paths) may be required to slow or stop at intersecting driveways or paths. Sight lines on the intersection approaches must be kept clear and priority should be considered for the heavier movement (e.g., cyclists across private driveways and minor, low-speed, low-volume streets) (see also C.10). 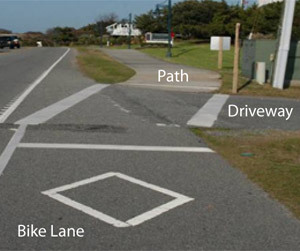 The photo to the left shows an example of a side path marked to illustrate the intent for cyclists to stop at driveways and cross streets (the markings do not conform to the MUTCD). However, if these stops are frequent or if conflicts with cross traffic are a rare occurrence, cyclists may disregard the traffic control. In some places, the stop or yield controls on the side paths directly conflict with or contradict other traffic control devices, which may create confusion in right-of-way that can result in crashes. C.3: Do traffic operations (especially during peak periods) create a safety concern for cyclists? C.3.1: Are there sufficient gaps in traffic or gaps created by geometry or traffic controls for bicycle crossings? Depending on the peak traffic volumes and vehicular speeds, various measures (e.g., yield or stop signs, traffic signals, median refuge, grade separation, etc.) may be installed to create adequate gaps for cyclists to safely cross. The RSA team should assess whether the installed measures are effective. The lack of adequate gaps may discourage cyclists from using the intended crossings and routes. Note that it is within the ability of the RSA team to recommend a study, but it may not be within its ability to recommend installation of devices that must meet warrants. The photo to the left depicts bicycle-only left-turn bays to facilitate left turns at an uncontrolled intersection. C.4: Are there any obstacles at crossings? Are the manhole covers properly designed? Manhole covers and drainage grates should be properly designed and installed. 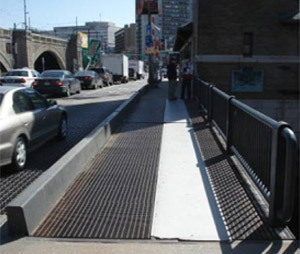 In addition to the orientation and spacing of grating bars, the structures should also be level with the pavement surface to avoid possible trapping or tipping issues. When practical, surface objects should be placed outside turning radii, where a cyclist is less balanced (see A.4.5). C.5/C.6 and D.5/D.6: If bollards or other physical terminal devices are used, is the risk of occasional motorized vehicles greater than the risk of a fixed object within the travel way? Visibility and retroreflectivity of device. Adequate width for all users (recumbent bicycles and bicycles with trailers are wider). Placement relative to the bicyclist’s travel path. Bollards that are not set back from the intersection can result in increased cyclist exposure to motor vehicles as they slow or stop to access the facility. Bicycles with long wheelbases such as trailers, “trail-a-bikes”, and tandems require greater clearance before encountering bollards, especially if near horizontal curves or intersections. A common crash type with these obstructions occurs when one path user obstructs the advance view of the bollard and then moves sideways to avoid it, leaving the following rider without time to react or avoid the obstacle. This crash type is still an issue for reflectorized or conspicuous bollards. The top photo to the left shows a moveable bollard retracted to just above the pavement surface. This may present visibility issues for cyclists using this facility as retraction reduces the bollards conspicuity. The bottom photo to the left shows bollards that are placed in the bicyclist’s travel path but do not effectively eliminate access for motor vehicles, which can enter on the right side of the bollard. Appropriate bollard positioning typically involves installing either one or three bollards positioned along the centerline and edge lines to minimize lane positioning issues for bicyclists that may lead to head-on bicycle crashes. 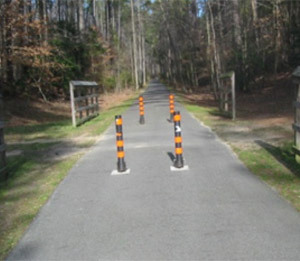 For example, the use of two bollards may cause a situation where two head-on cyclists may choose to use the center gap at the same time and lead to a head-on collision. C.7: Are bicycle accommodations continuous, or do they end abruptly at crossings/intersections/interchanges? It is desirable to provide continuous and connected bicycle facilities through intersections and interchanges to minimize confusion and conflicting maneuvers between all modes. When bicycle lanes terminate near an intersection, some provision should be considered for a short distance after the intersection (e.g., a short section of bicycle lane or shared lane markings) to guide the bicyclist through the intersection. When bicycle lanes are dropped across an intersection, adequate advance warning of the changing conditions should be provided. The desirable bicycle travel path may not be readily apparent through some intersection or interchange configurations with offset lanes or merge areas. These configurations may also restrict the amount of travel space available to a cyclist. 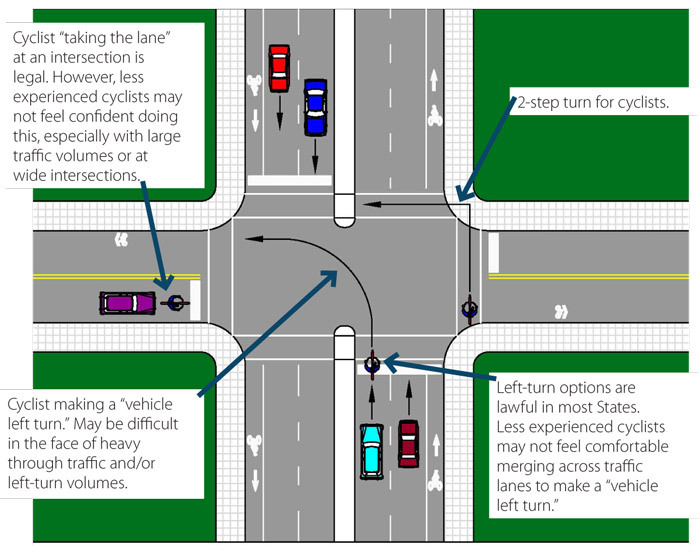 Consideration may be given to defining lanes through the intersection (see D.2 and D.7). C.8/D.8: Are the intersection/transition and paths leading to the transition adequately lit? Locations where conditions may change rapidly, such as under bridges or in tunnels (see B.8). Approach lighting provides time to assess conditions and helps a road user to properly adjust to those conditions (see A.8). C.9: Can cyclists see approaching vehicles/pedestrians at all legs of an intersection/crossing, and vice versa? Consideration should be given to both permanent and temporary features. User awareness should also be considered as described in Figure 14. C.10: Do signs and markings along the cycling facility clearly indicate the cyclist path and right-of-way at intersections? Traffic control devices that are relevant to bicycle travel should provide clear and consistent messages to all road users. Pavement markings and signs should be consistent with each other to correctly convey their intent (see A10.1 and B.10). In the top photo to the left, pavement markings indicate proper placement for cyclists at the intersection. In the bottom photo, the centerline on the shared use path is dashed. There is no signing or markings to indicate which approach has the right-of-way. Solid lines should be used where there are potentially conflicting movements, steep gradients, or where visibility is reduced. C.11: Does the traffic signal design accommodate all users? C.11.1: Are signals, bicycle detection, and bicycle push buttons properly located and functioning? Do problems result from inconsistent bicycle detection types? Many actuated traffic signals are not configured to detect bicycles. Signal detection should be considered, particularly when concurrent vehicular traffic volumes are low, as the signal may require an automatic recall setting to service bicycles. All signal detection types should be maintained and checked to operate effectively for cyclists. Consider whether cyclists are able to determine the location to trigger detection and whether observed cyclist stopping locations don’t match up well with detector locations. If used, push-buttons should be placed conveniently for the cyclists to reach. C.11.2: Are there conflicting traffic movements during bicycle crossing phases? Signal phasing should consider the needs of crossing cyclists. If significant conflicts are present, then exclusive bicycle phases may be considered. Particular attention should be given to locations where a side path is present at a signalized intersection. At this type of location, the signal timing should provide adequate gaps and should minimize conflicts between path users and motor vehicles within the crosswalk and between pedestrians and cyclists on other connecting facilities, such as sidewalks. The photo to the left shows a shared use path with a separate signal for pedestrian and bicycle traffic to cross the intersection. However, pedestrian traffic on the sidewalk may conflict with the path movement. Traffic signs and pavement markings are used to direct traffic through the intersection and alert cyclists of crossing pedestrians, but the combined use of stop and yield lines may be confusing to approaching path users (the combined use of stop and yield lines does not conform to the MUTCD). C.11.3: Do traffic signal clearance intervals safely accommodate cyclists? Signal timing should allow for adequate clearance intervals for cyclists in a variety of situations, including standing starts and rolling approaches. Signal phasing, timing, and coordination may need to be adjusted if the end of the progression does not provide adequate time for a cyclist to clear an intersection prior to the release of an opposing traffic stream. The photo to the left shows a cyclist waiting for a dedicated bicycle traffic signal phase. D.2: Are transition areas designed appropriately with logical termini or do they end abruptly, potentially contributing to sudden and difficult merges, uncontrolled crossings, or behaviors such as wrong-way riding? A through lane becomes a turn lane. Termini where traffic volumes and speeds change. 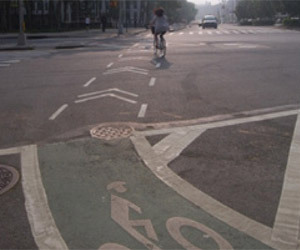 The bottom photo to the left shows a wide, bikeable shoulder terminating at an intersection (see also A.2 and C.2). D.3: Do shared roadway geometrics change substantially or frequently? Are appropriate warnings and transitions provided? Are there consistent levels of accommodation for bicyclists provided along a corridor where there are similar traffic volumes and speeds? D.4: Is there an abrupt change in riding surface? Surface changes from paved to crushed stone or other riding surfaces can cause cyclists to lose control depending upon entry speed. Surface changes without warning, particularly at the end of a downgrade or in a curve, can be particularly detrimental (see also A.4.2 and A.4.7). D.5 and D.6: If physical terminal or transition devices are used, are they needed and is there sufficient width on either side (see C.5 and C.6)? D.7: Is there a safe way for cyclists from both directions to access connections or continue to other destinations along the street network? Transitions from one facility to another (e.g., shared use path to roadway shoulder) should be designed so as to direct users to ride in the correct direction of travel. Roadway and path alignment along with the presence of marked crossings and wayfinding signs all influence how the facilities are used. These characteristics may contribute to inappropriate riding behavior such as wrong-way riding (see also A.7). 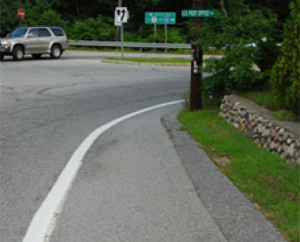 The photo to the left shows the transition between an off-road shared use path and a bicycle lane (note that diamond pavement markings for a bicycle lane do not conform to the MUTCD). The alignment, signing, and markings insert bicyclists into a driveway location from an unexpected direction and appear to encourage wrong-way riding in the bicycle lane. Consideration should also be given to the location of popular origins and destinations along a road that are frequented by cyclists. Accommodations should be provided (as necessary) to cross cyclists from one side of the roadway to the other. D.8: Are the intersection/transition and paths leading to the transition adequately lit (see C.8)? D.9: Is the visibility of cyclists as they make the transition from one facility or roadway geometry to another adequate from the perspective of all road users? Obstructions caused by roadside features (e.g., fences and vegetation). Location of the transition with respect to roadway geometry (e.g., shoulder drop and turn lanes) (see also A.9 and C.9). 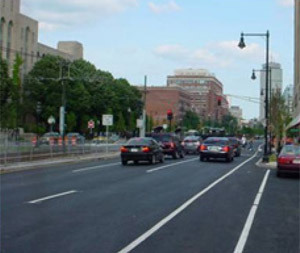 The picture to the left depicts a bike lane that hooks right through a major intersection and transitions to a protected bikeway. Chevrons on the pavement help guide cyclists and show motorists the path provided for cyclists through the intersection (note that the chevron pavement markings do not conform to the MUTCD). D.10 and D.11: Are signs and markings at transition areas appropriate? Transitions and termini should be appropriately signed and marked to warn cyclists of conditions ahead, particularly at locations at which cyclists do not expect transitions or termini. Likewise, motorized vehicles should have adequate warning when off-road bicycle facilities transition to on-road facilities. The intended paths of all road users should also be appropriately signed and marked at the point of transition. Additional attention may be given to locations with high volumes of unfamiliar users or tourists. E.2 and E.3: Are transit facilities designed and placed to minimize conflicts with other modes? E.2.1: Are transit stop locations appropriate for cyclists? Transit stops and shelters should be located near cyclist generators and along expected paths connected by safe crossings (see also A.2 and C.2). E.2.2: Do transit facilities provide adequate separation between cyclists and other modes of travel? Merging maneuvers of cyclists in and out of travel lanes. Weaving maneuvers of cyclists and transit vehicles. Spacing of bus stops and frequency of conflicts/merging/weaving maneuvers. The top photo to the left shows an area where high volumes of cyclists and regular bus service can create frequent conflicts between buses and cyclists. One cyclist is riding in the bus driver’s blind spot. This condition requires vigilance from the bus operator and predictable behavior from the cyclist. The operating widths of buses and bicycles should also be taken into consideration. The photo at the bottom left shows a shared lane marking set 11 feet from the curb at a bus stop. An RSA team should consider whether the pavement marking placement and visibility may cause a conflict between cyclists and a waiting bus (see A.10). E.2.3: Do waiting areas at transit stops provide sufficient space for cyclists? Space for boarding and alighting cyclists and other transit users during peak periods. Clear paths for cyclists and pedestrians (see C.2). 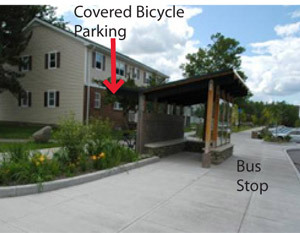 The photo to the left shows a designated bike waiting area at a bus stop. The designated area is at the loading area for cyclists outside of pedestrian paths on the sidewalk. In addition to reducing conflicts, designated waiting areas may also improve transit operational efficiency. E.2.4: Do paths accessing transit stops minimize conflicts between cyclists and other modes of travel? Conflicts may occur between cyclists and pedestrians on designated paths accessing transit facilities (see E.7). In the photo to the left, a cyclist is using an automated fare collector and is partially blocking access to the platform. Furthermore, the width of the access ramp to the platform is narrow and may not adequately accommodate peak demands, especially when pedestrians with mobility restrictions and cyclists are both present. E.4: Are transit stops maintained during periods of inclement weather? E.4.1: Is snow removed from waiting areas at transit stops? Is there sufficient storage area for removed snow? When heavy snow is common, snow removal and storage should maintain full access to facilities. E.4.2: Have the effects of weather been adequately considered? Drainage around a transit stop should not limit access for cyclists (see A.4). Shelter space allows for all weather use, particularly at high-activity stops. Designs for overhead structures should consider maximum heights for cyclists and whether cyclists are provided with riding and waiting spaces (see B.5). E.5: Is the waiting area free of temporary / permanent obstructions that constrict its width or block access to the bus stop? 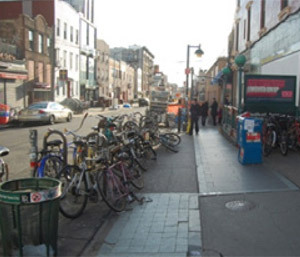 The photo to the left shows a location where the sidewalk was widened and bike racks were installed in the street furniture zone to maintain adequate access to a busy subway station. E.6: Are bicycle accommodations connected and convenient for transit users? Waiting areas at transit stops. Bicycle parking at or near transit. The photo to the left shows covered bicycle parking conveniently located behind a bus stop, with wide paths leading to the stop. Bicycle parking should be located as close to the activity as possible without impeding or conflicting with other users (see D.7 and E.2). E.7: Are crossings convenient and connected to continuous facilities for cyclists? Adequacy of gaps created for cyclists to cross to transit stops. E.8: Are transit access ways and facilities adequately lit? Paths to bicycle parking (see A.8, C.8, and D.8). E.9: Is the visibility of cyclists using the facility adequate from the perspective of all road users? Transit users (pedestrians and cyclists). User awareness should also be considered as described in Chapter 3, Figure 14 (see also A.9, B.9 and C.2). E.10: Are signs and markings at designated areas for cyclists using transit appropriate? Pavement markings and signage should clearly indicate assigned space on the roadway, especially in areas where there is a high potential for conflict (see A.10). Additionally, cyclists waiting to board or depart transit vehicles should not conflict with pedestrians (see E.2.3). In the photo to the left, the bike lane pavement markings have faded. Pavement markings typically have a shorter life where there is heavy traffic crossing the markings, such as at this heavily-used bus stop. Federal Highway Administration. The National Bicycling and Walking Study: 15-Year Status Report. May 2010. Marin County Bicycle Coalition. Marin Pedals Ahead. The Washington Post. Bicycle Program Makes District Easier Place to Get Around, Residents Say. November 26, 2010. Campaign to Protect Pedestrians, Cyclists as Number of Crashes in the District Rises. March 30, 2011. New York City Department of Transportation. Commuter Cycling Indicator. United States Department of Transportation, Bureau of Transportation Statistics. Nationwide Personal Transportation Survey. Washington, D.C., 1990. Hunter, W. W., J. C. Stutts, W. E. Pein, and C. L. Cox. Pedestrian and Bicycle Crash Types of the Early 1990s. FHWA-RD-95-163. June 1996. Stutts, J. C. and W. W. Hunter. Injuries to Pedestrians and Bicyclists: An Analysis Based on Hospital Emergency Department Data. Publication No. FHWA-RD-99-078. 1997. National Highway Transportation Safety Administration. Traffic Safety Facts: Bicyclists and Other Cyclists. 2007. Federal Highway Administration. FHWA Road Safety Audit Guidelines. Publication No. FHWA-SA-06-06. February 2005. Pedestrian Road Safety Audit Guidelines and Prompt Lists. Publication No. FHWA-SA-07-007. July 2007. Institute of Transportation Engineers. Roadway Separated Bikeways in the US and Canada: Past, Present, & Future. June 9, 2009. Federal Highway Administration. Manual on Uniform Traffic Control Devices (MUTCD). 2009. United States Department of Transportation. Policy Statement on Bicycle and Pedestrian Accommodation Regulations and Recommendations. Metropolitan Washington Council of Governments. Bicycle and Pedestrian Plan for the National Capital Region. October 2010. Adaptation from CROW. Design Manual for Bicycle Traffic. 2006. Cambridge Environmental and Transportation Planning Division. Bicycle Trends in Cambridge. April 2010. The University of North Carolina Highway Safety Research Center. North Carolina Bicycle Crash Types, 2005-2009. August 2011. Thomas, L., C. Hamlett, W. Hunter, and D. Gelinne. Identifying and Prioritizing Locations for Pedestrian and Bicyclist Safety Improvements in Chapel Hill and Carrboro, North Carolina. North Carolina Department of Transportation, 2009. The University of North Carolina Highway Safety Research Center. North Carolina Bicycle Crash Facts 2004 – 2008. August 2010. Harkey, D. L., S. Tsai, L. Thomas, and W. W. Hunter. Pedestrian & Bicycle Crash Analysis Tool (PBCAT): Version 2.0 Application Manual. Publication No. FHWA-HRT-06-089; Software FHWA-HRT-06-091. 2006. MetroPlan Orlando. Orlando Area Bicyclist Crash Study: A Role-Based Approach to Crash Countermeasures. A Study of Bicyclist-Motorist Crashes in the Orlando Urban Area in 2003 and 2004. League of American Bicyclists. Smart Cycling: Traffic Skills 101. United States Department of Transportation. Policy Statement on Bicycle and Pedestrian Accommodation Regulations and Recommendations. March 11, 2010. Oregon Department of Transportation. Bike Lane Matrix. Axelson, P., D. Chesney, D. Galvan, J. Kirschbaum, P. Longmuir, C. Lyons, and K. Wong. Designing Sidewalks and Trails for Access Part I of II: Review of Existing Guidelines and Practices. Federal Highway Administration, 1999. Kirschbaum, J., P. Axelson, P. Longmuir, K. Mispagel, J. Stein, and D. Yamada. 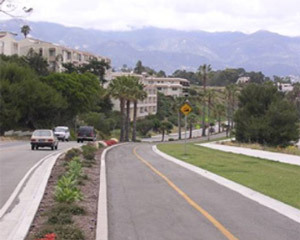 Designing Sidewalks and Trails for Access Part II of II: Best Practices Design Guide. Federal Highway Administration, 2001.